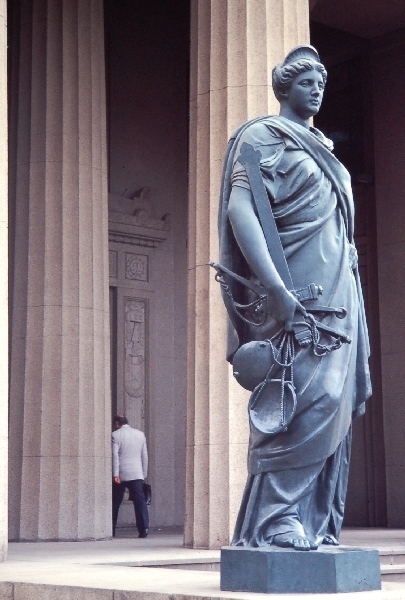 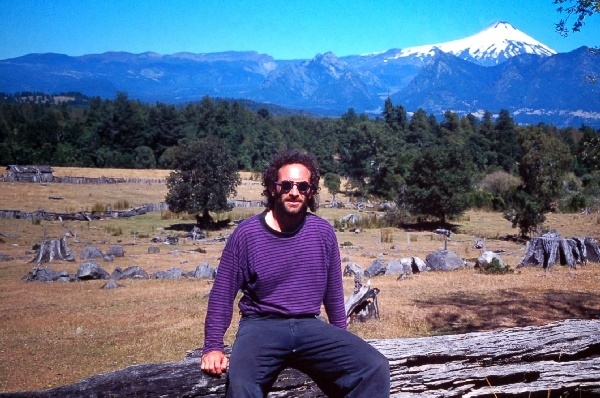 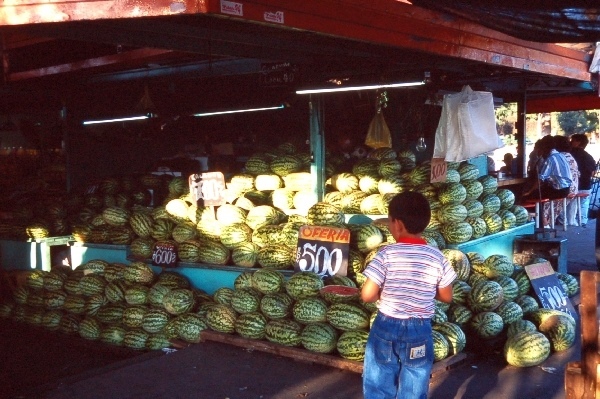 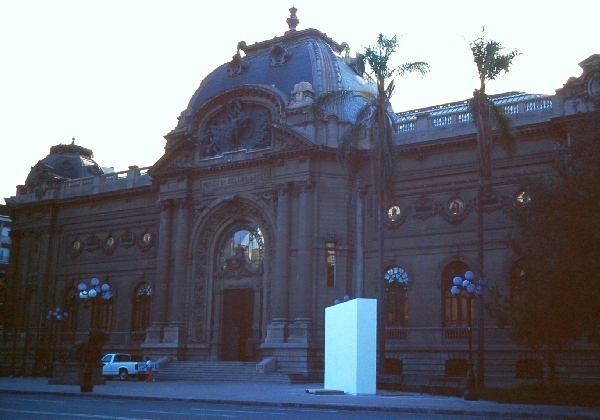 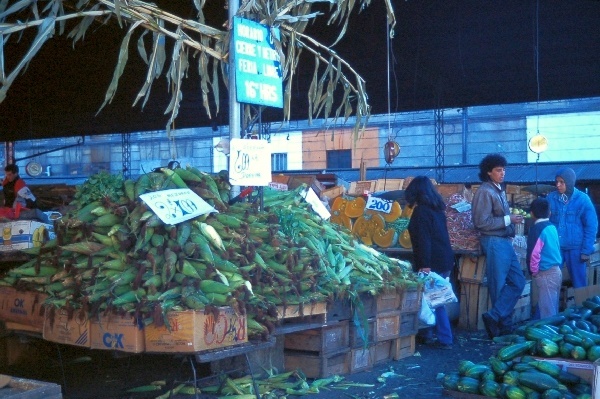 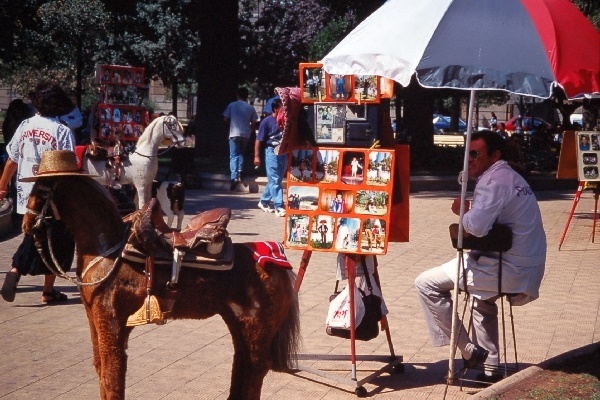 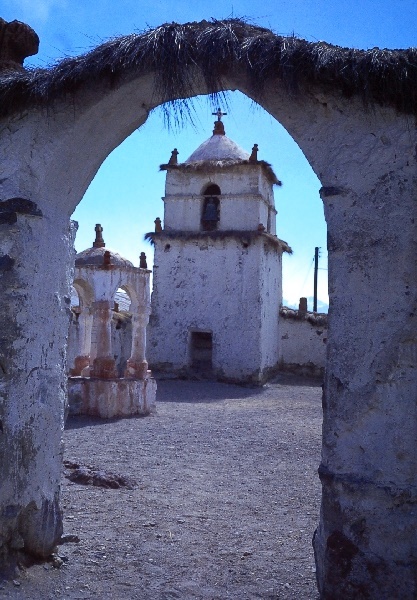 I was in Chile in for 3 weeks in 1995 after traveling in Argentina and again for a week in 1996 at the end of my trip to Bolivia. 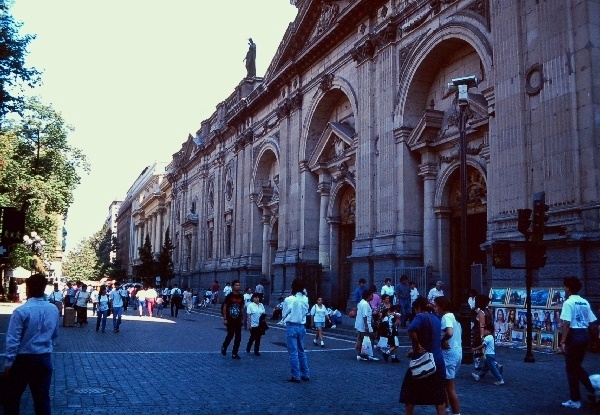 The capital, Santiago is in the mountains and is not a bad city at all but it was not very exciting then either. 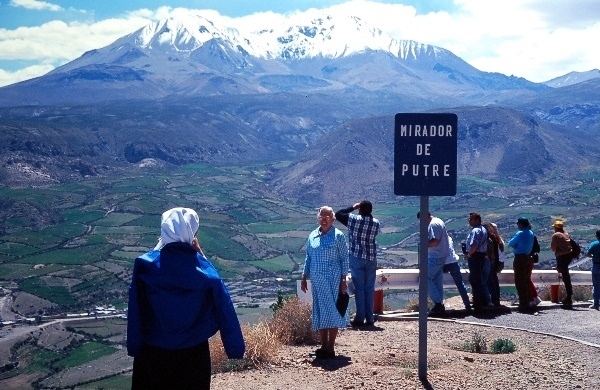 This was not so long after the reign of Pinochet and although I didn’t see any direct repression, one still had the feeling that the police really watched the backpack tourists. 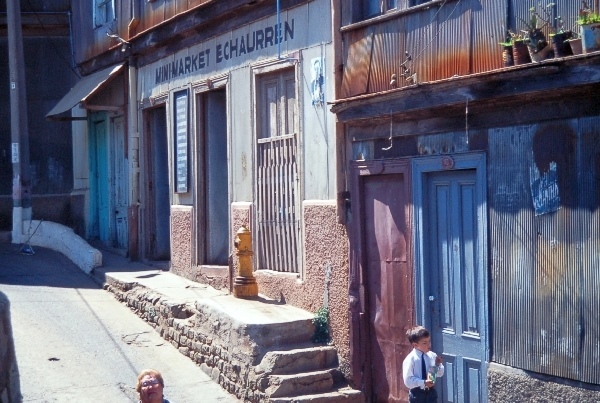 This certainly wasn’t the place for longhaired freaks to get wild and crazy. 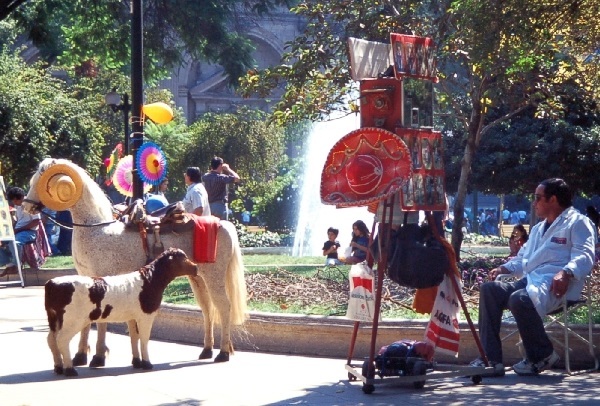 One afternoon, I lay out in a park in my shorts to get a little sun and the police hassled me. 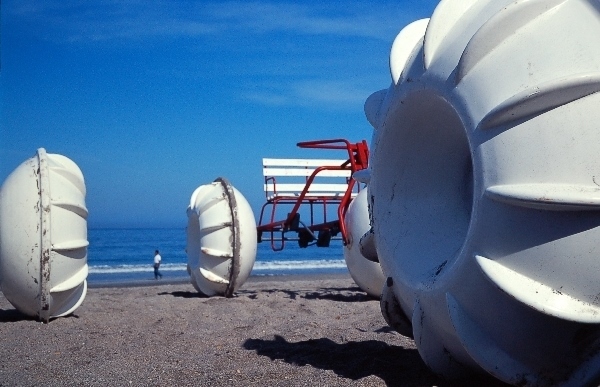 I guess such a thing is only ok at the beach and if I had been a local I would have had even more trouble. 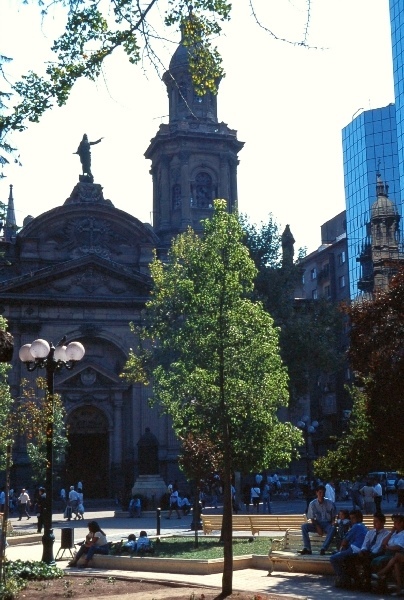 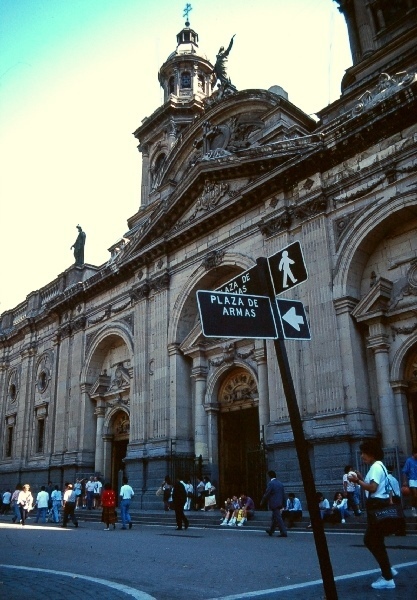 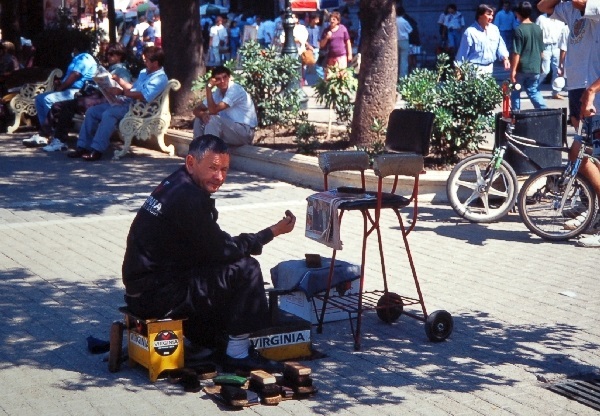 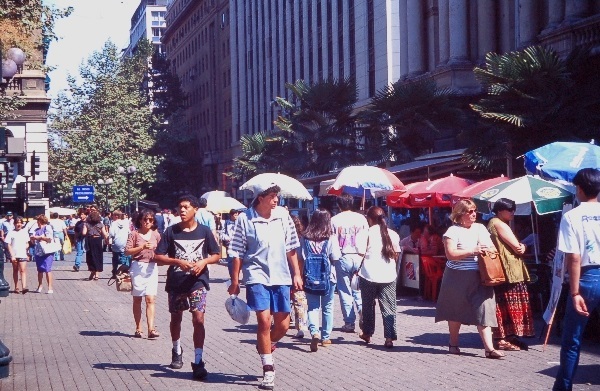 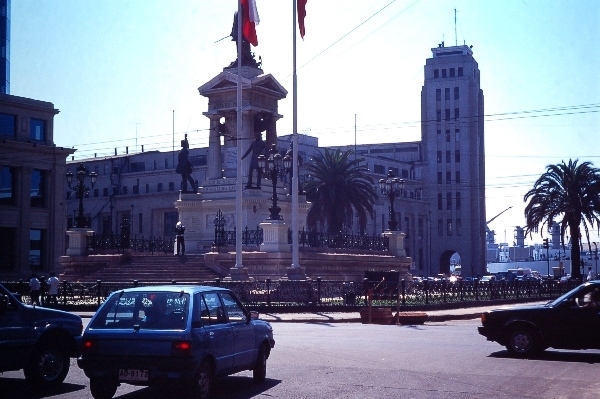 Much of Santiago looked prosperous with a number of walking streets in the center business district. 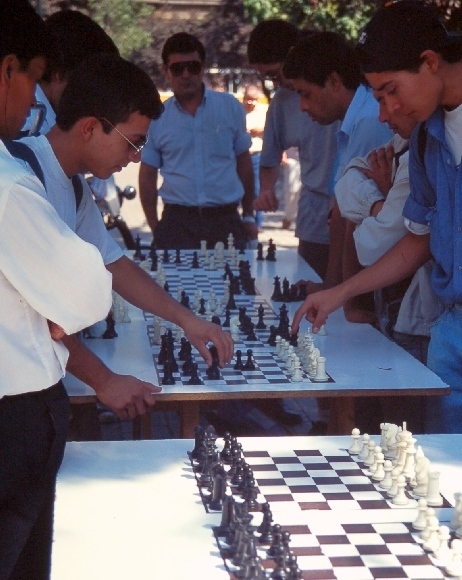 I entertained myself by watching the chess players around the main plaza pictured below and going to the Natural History Museum. 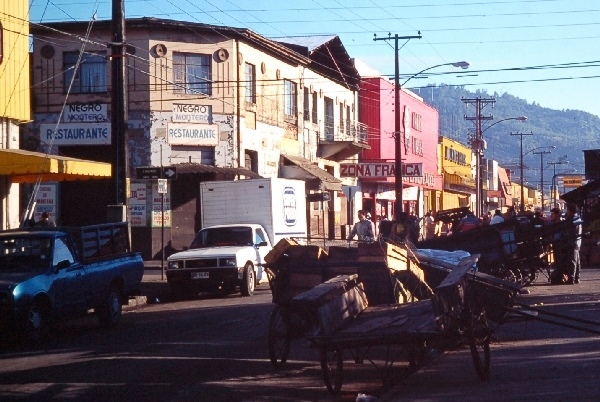 The area called Bella Vista was the center for nightlife but I didn’t care much for it. 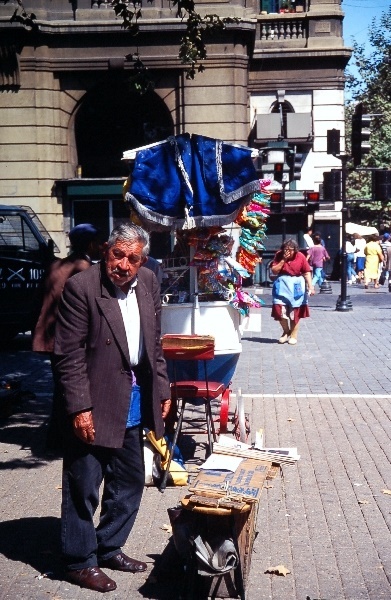 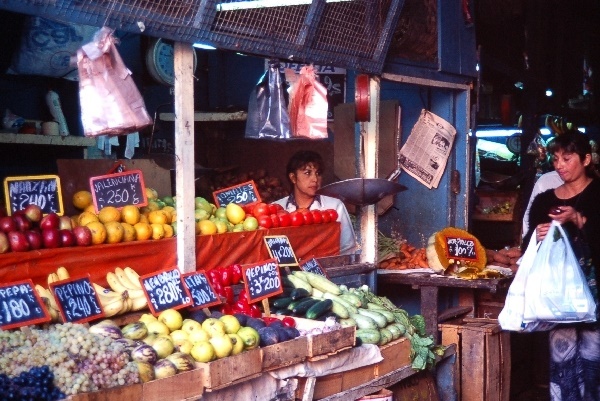 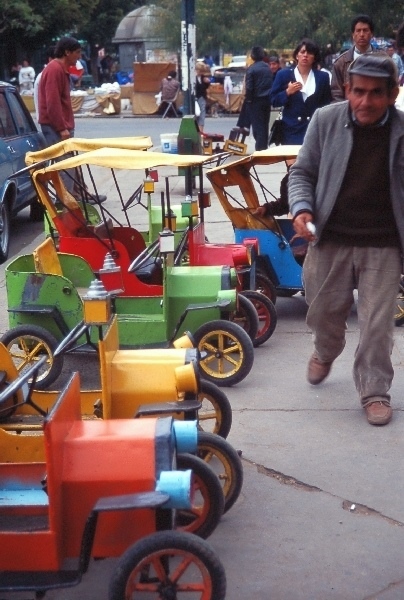 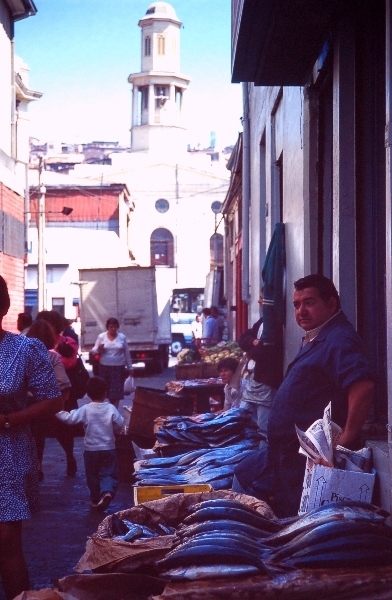 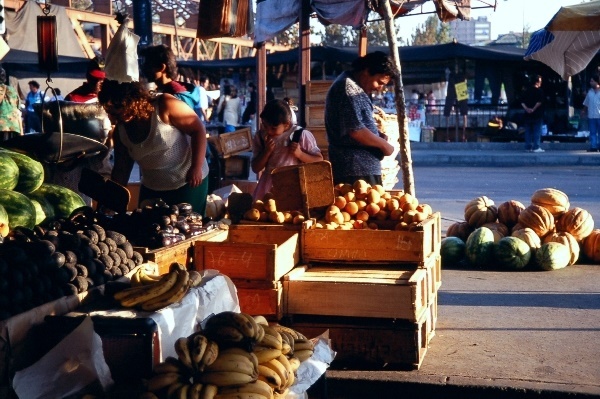 Sure there were still street vendors but the economy was booming then and the Argentineans who seem to have a rivalry with Chile were dismayed to see their standard of living being over taken by their neighbor. 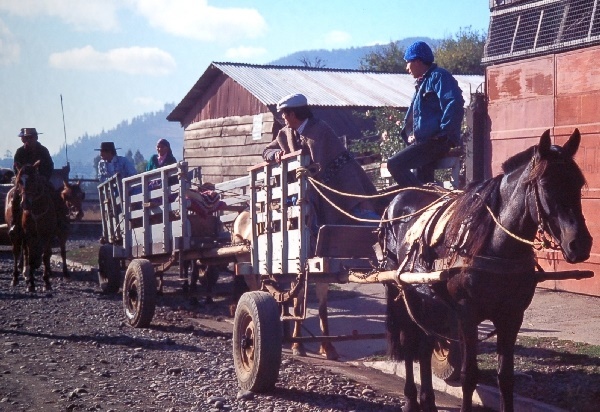 After a few days in Santiago, I took a night bus to Temuco, over 600 kilometers to the south. 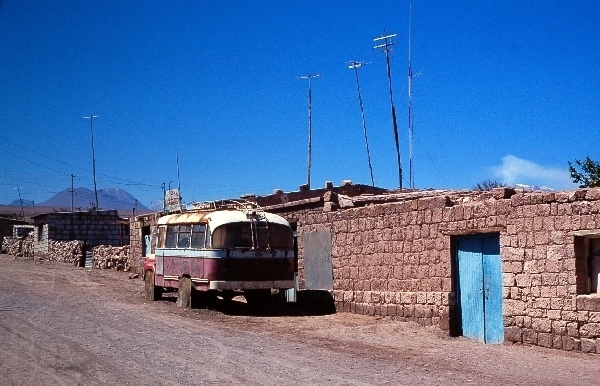 The bus was real luxury, seats reclining to nearly a full sized bed and before they showed a cowboy film on video they played bingo. 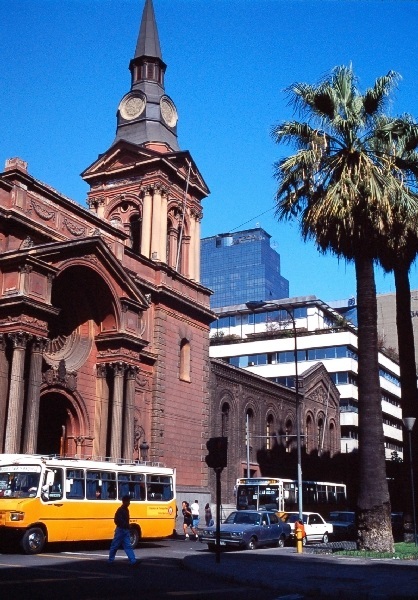 The buses were really amazing in Chile. 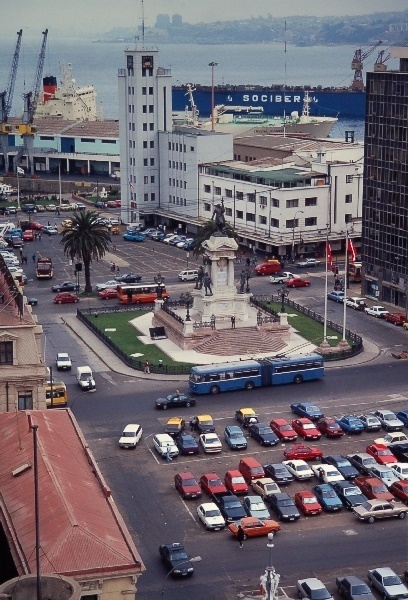 They have the wealth to buy top quality buses and it makes economic sense since not everyone is wealthy enough to have a car or take a flight. 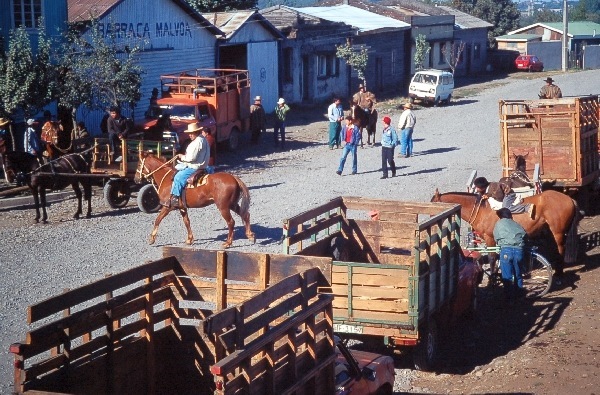 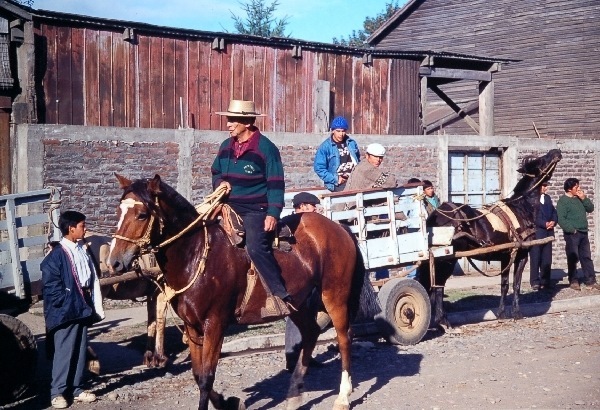 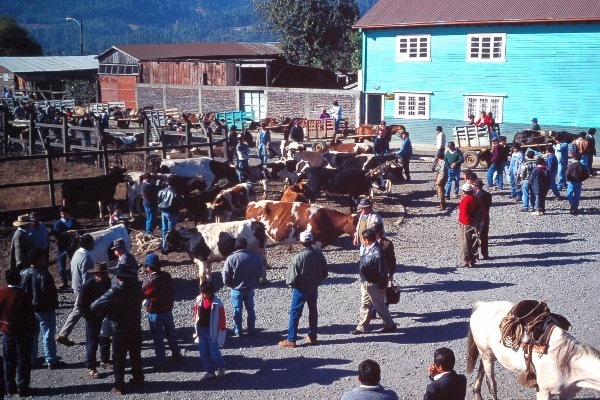 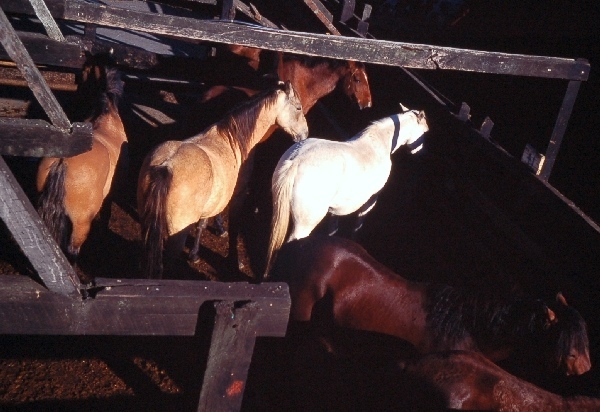 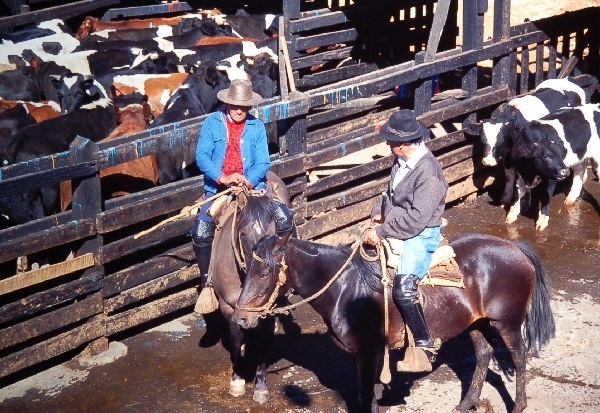 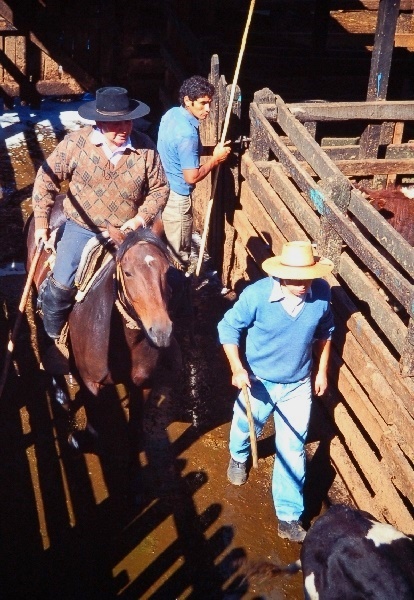 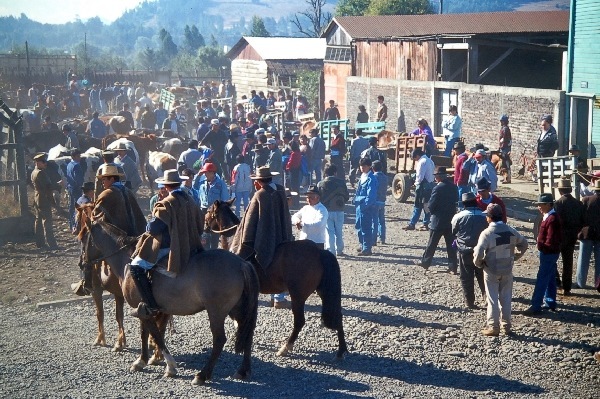 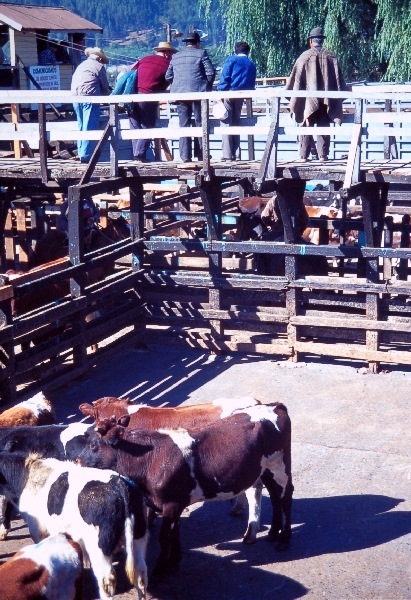 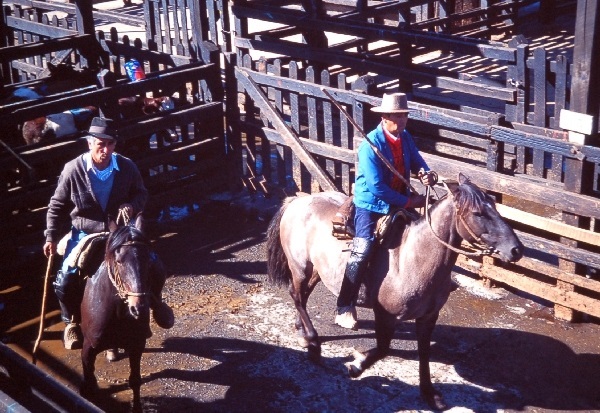 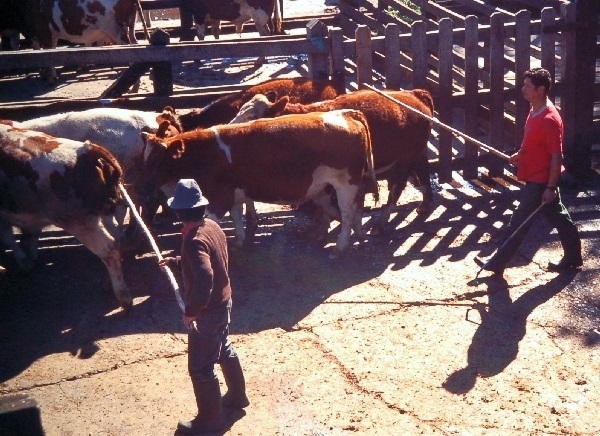 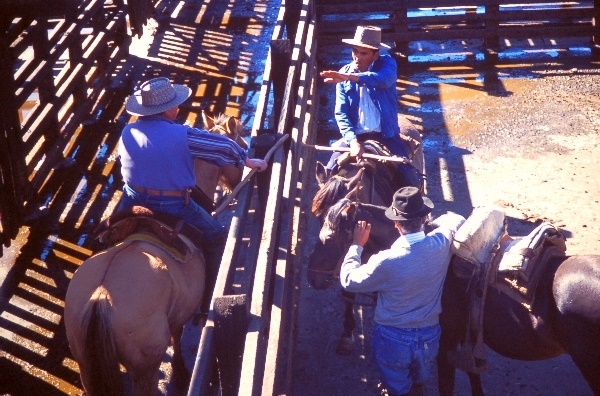 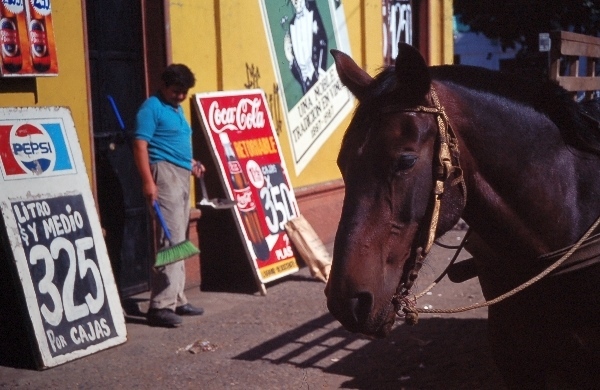 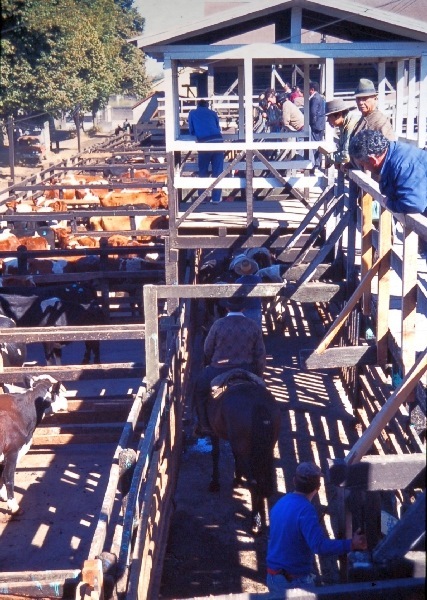 A big attraction in Temuco is the cattle and horse market and from the looks of the place you can bet that ranching was a big deal in that part of the country. 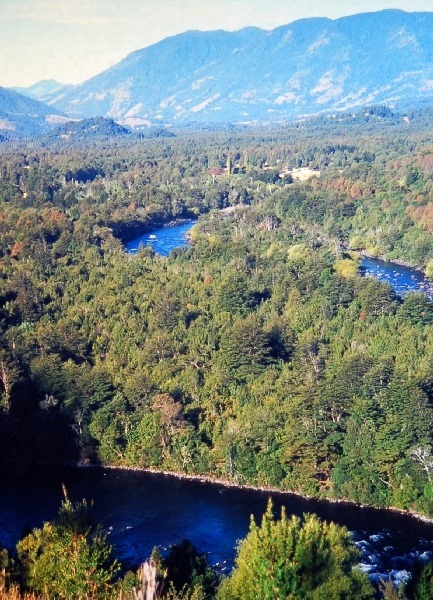 But Temuco is the big city in the region and a hub for exploring southern Chile. 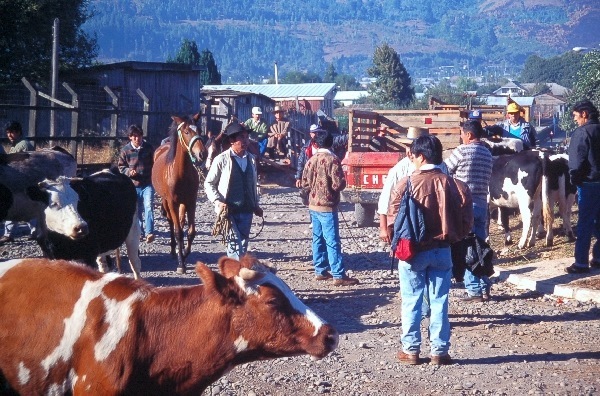 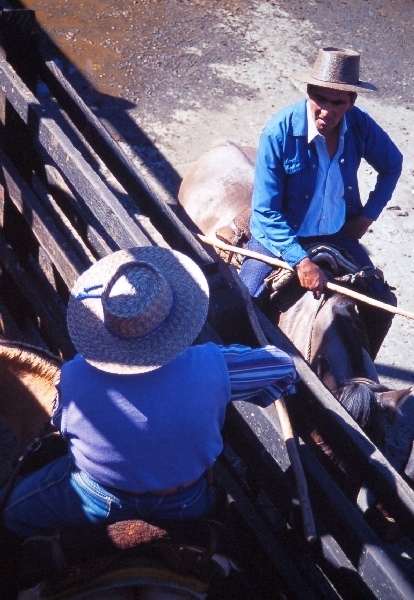 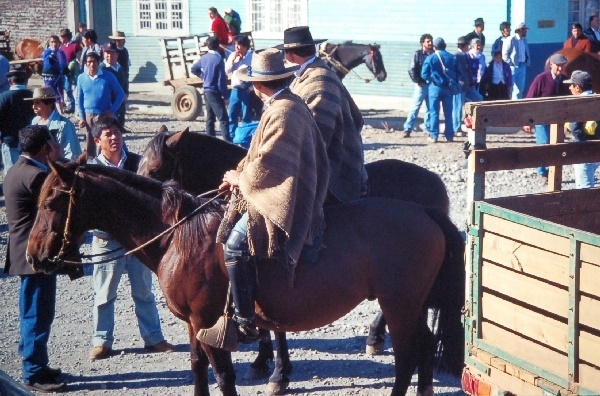 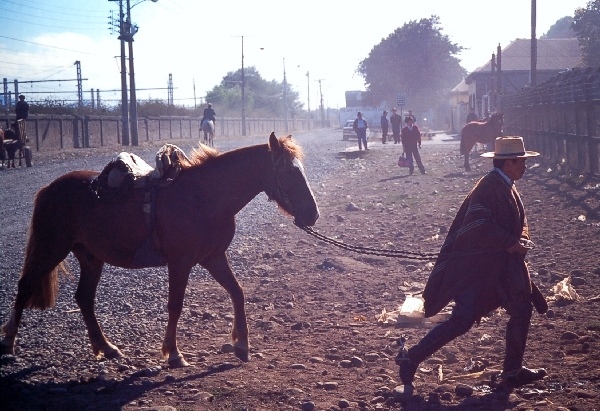 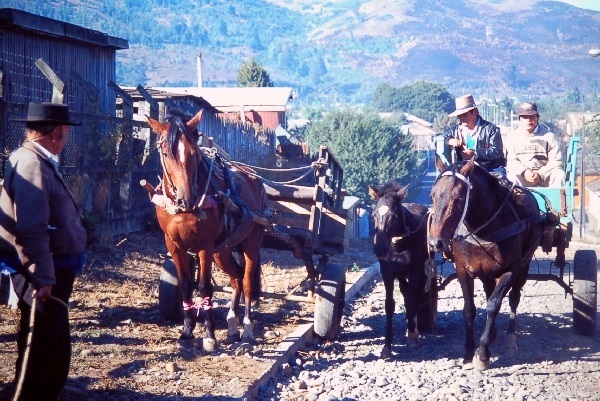 I saw lots of cowboy types in Temuco in contrast to Indians, which aren’t so visible in most of Chile. 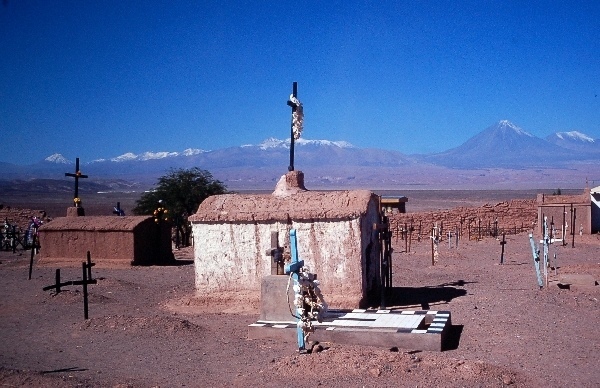 But there was a lot of pride and information available about the Mapuche Indians who lived in Southern Chile and Argentina. 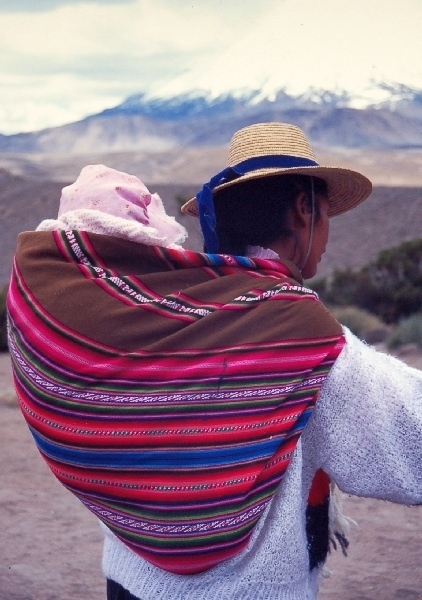 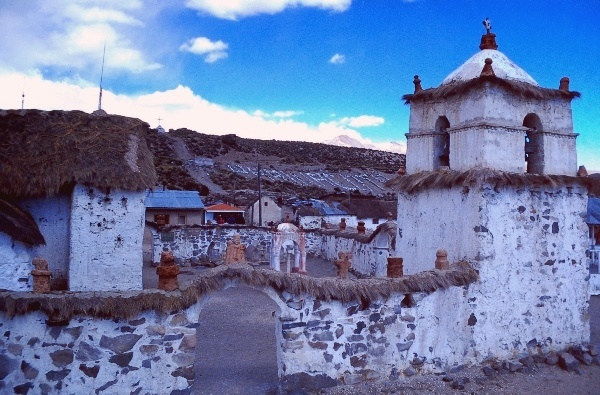 The held off the Incas and later the Spanish for hundreds of years before the colonists of Chile overwhelmed them. 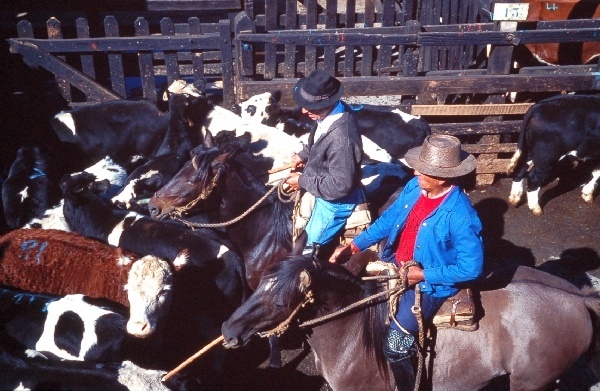 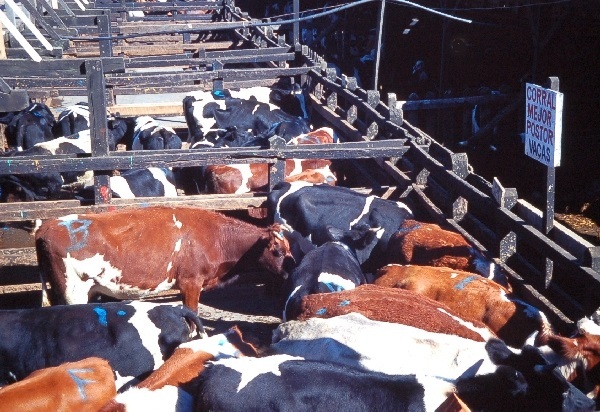 They didn’t get massacred but their agricultural economy was destroyed and they starved or died of diseases. 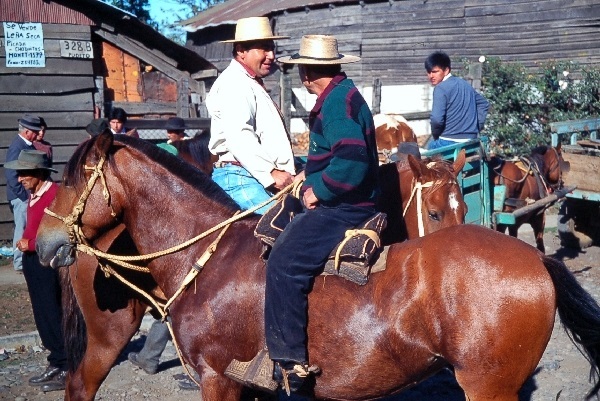 The rural town of Chol Chol is a nice day trip from Temuco and has a large percentage of Indians although they didn’t tend to wear traditional dress. 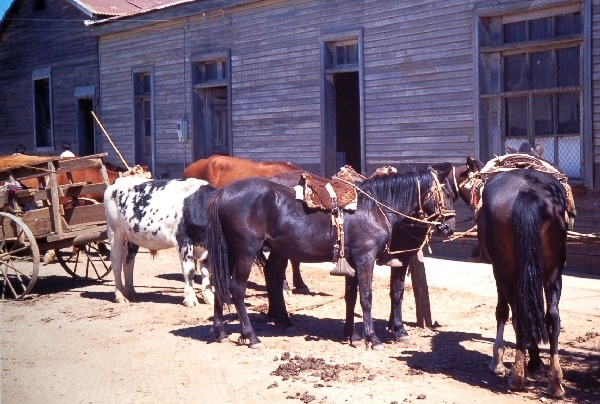 Both the architecture of many buildings, the animals and the dress of the people made me think of the “wild west” of the USA say 1870. 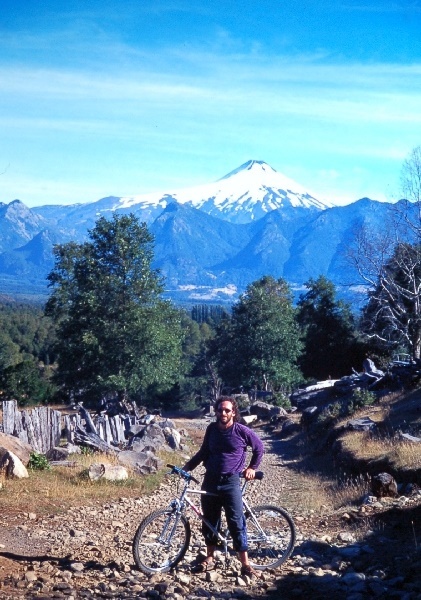 From Temuco I went about 80 kilometers southeast to the town of Pucon, which was a base for many backpackers to trek or bike in the area. 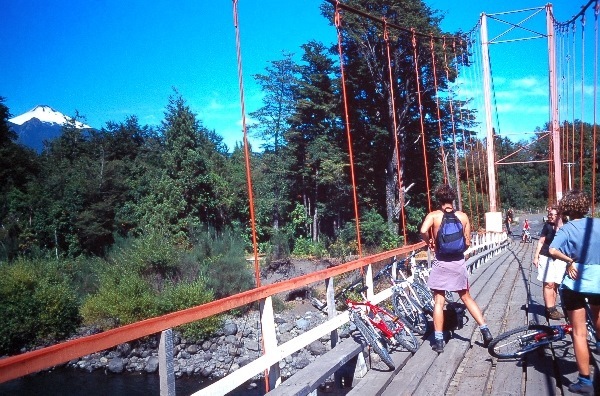 I rented a great mountain bike and had a nice trip along a river to some waterfalls with some others from my hostel. 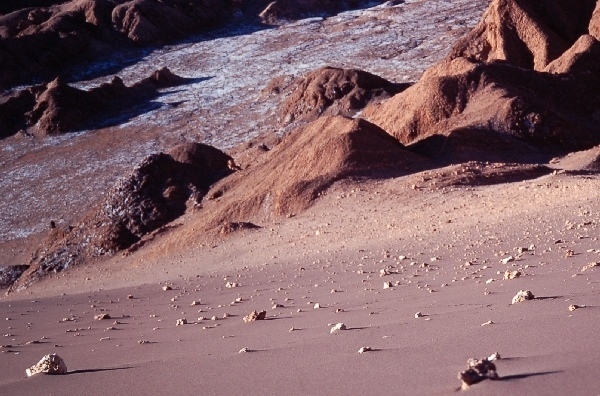 Half way back from the falls, I realized I didn’t have my money-belt, which contained all of my valuables. 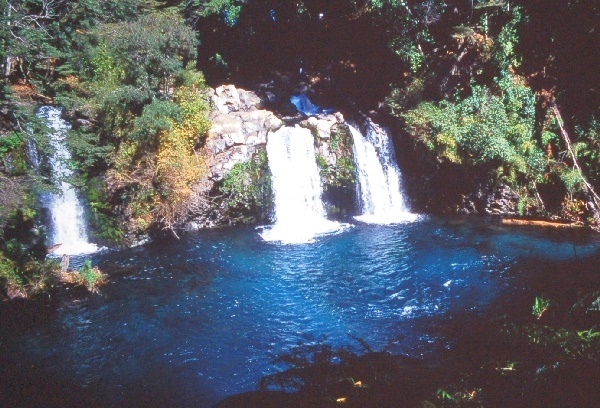 I returned to the falls to look for it to no avail. 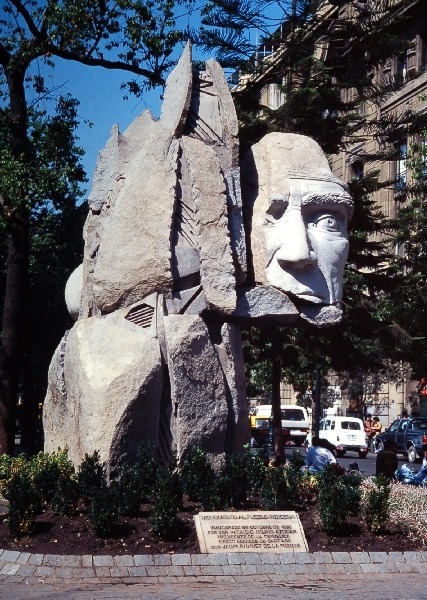 When I finally got back, I was tired and nearly shitting myself thinking I had lost my money, passport and flight ticket home. 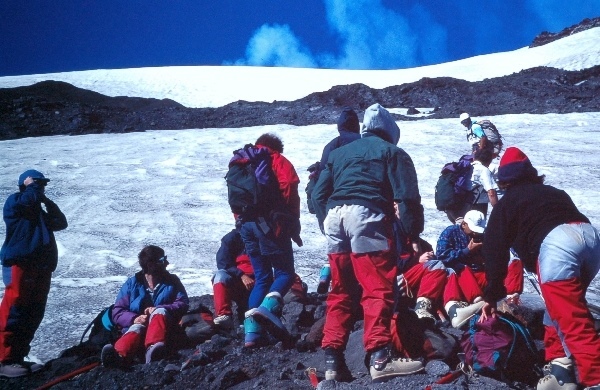 And there sitting on my bed was my money-belt which luckily didn’t get stolen since I was in a shared room with half a dozen others and anybody could have walked in and taken it, lucky me. 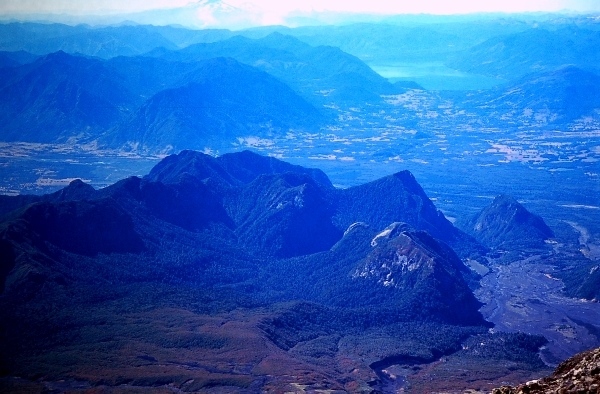 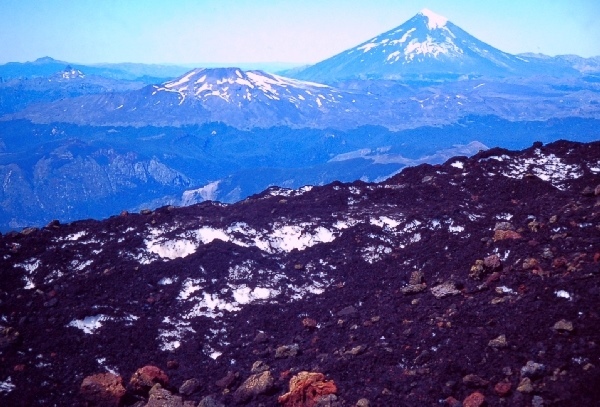 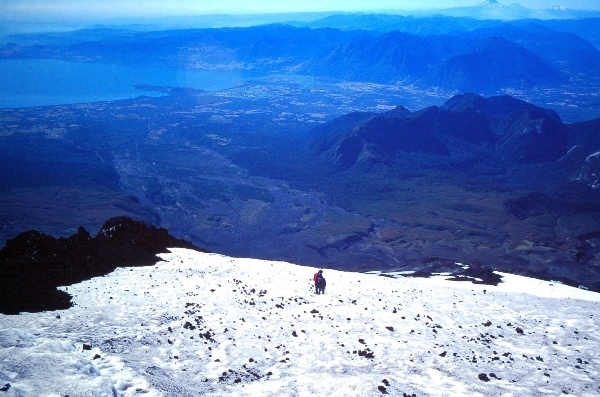 Less than 10 kilometers from Pucon is the Villarrica National Park centered around a high snow and ice topped live volcano of the same name. 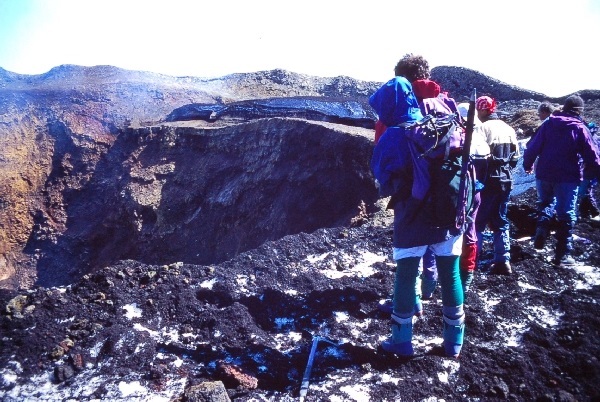 To climb the volcano one must go on a guided tour, due to safety reasons, which costed 40 USD but was definitely worth it. 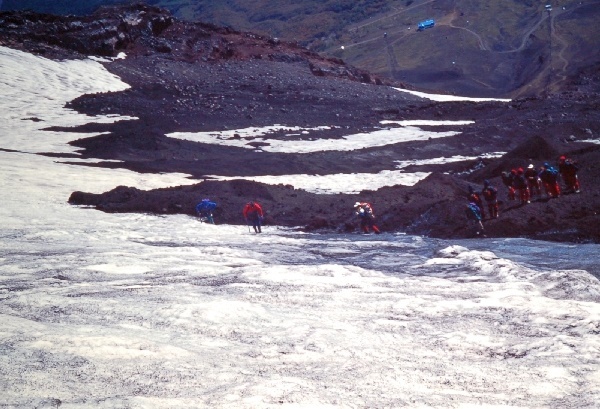 They transport you to the park and supplied good protective clothing and crampons for the ice. 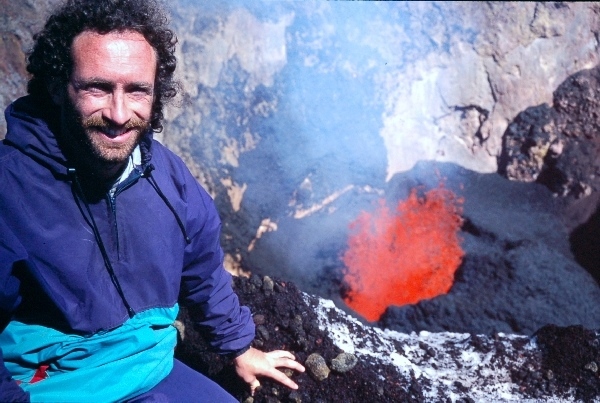 It was surreal to climb over a glacier and then look down into the core bubbling and spitting lava with clouds of sulfurous steam wafting out. 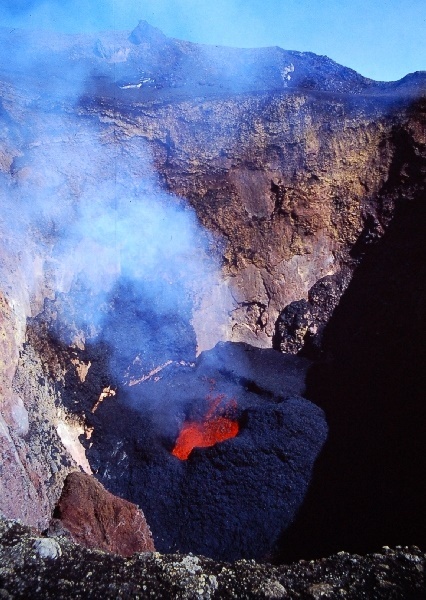 Sure, the volcano I visited in Hawaii is spewing more lava but then you can’t go anywhere near the rim, none-the-less look down inside. 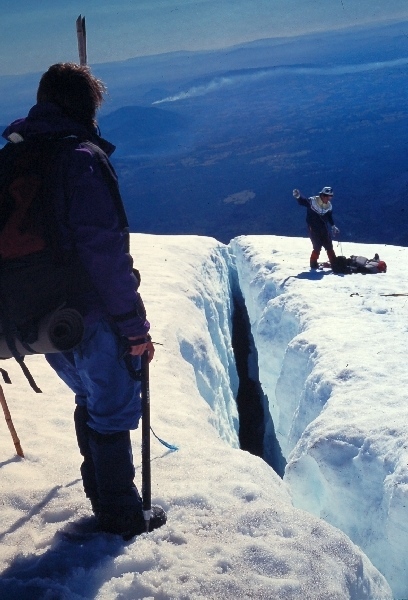 As if the lava and fumes on Villarrica weren’t dangerous enough, the guide showed us one of many crevices, like in the picture here that are constantly opening in the ice. 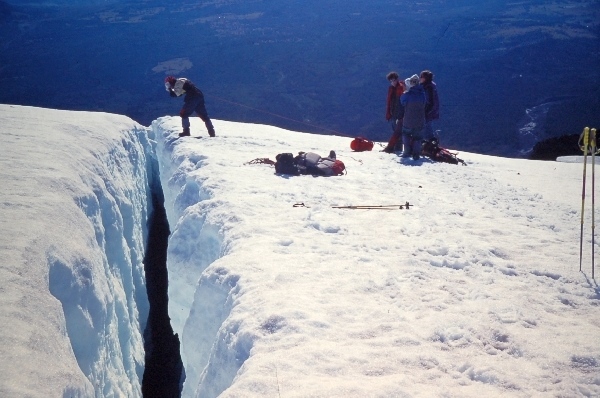 Then again; no risk, no fun – as long as the risk is calculated and not just an adrenalin addiction. 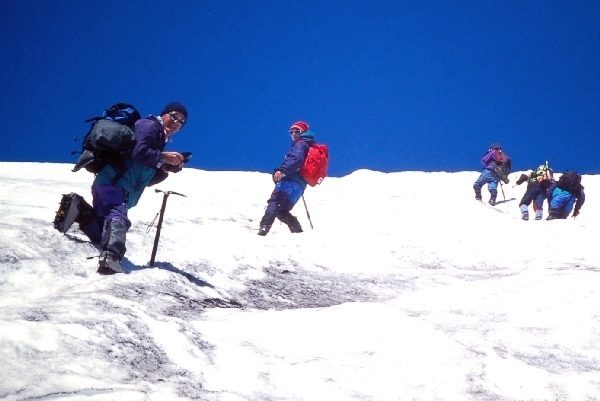 On the way up one is focused on reaching the summit. 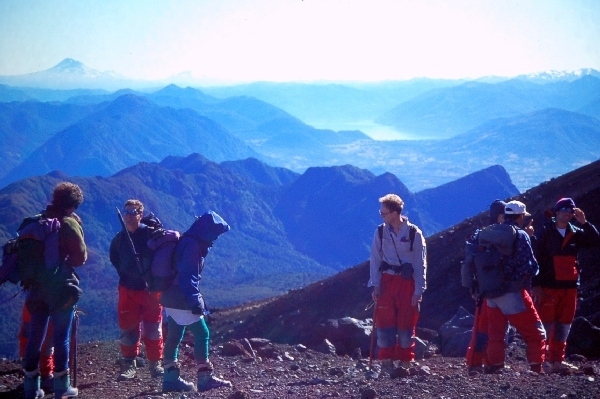 Descending, one has time to really enjoy the amazing panoramic views of that part of the country. 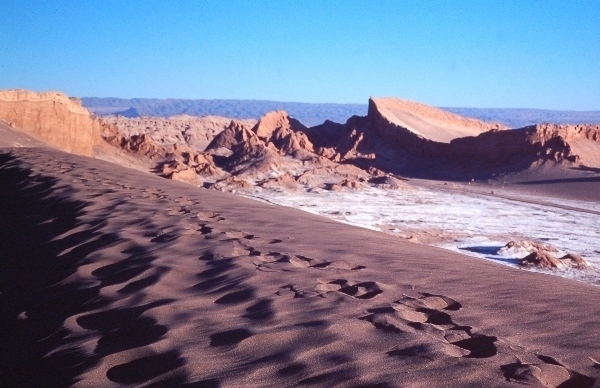 The coast of northern Chile is desolate but the highlands sharing the boarders to Bolivia and Argentina are very interesting. 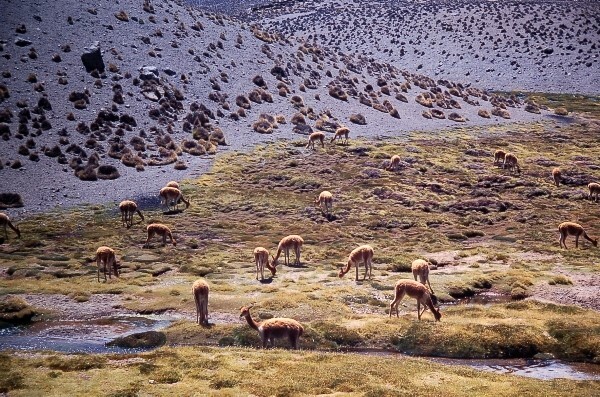 The terrain is high plateau and one see a lot of llamas and vicuñas. 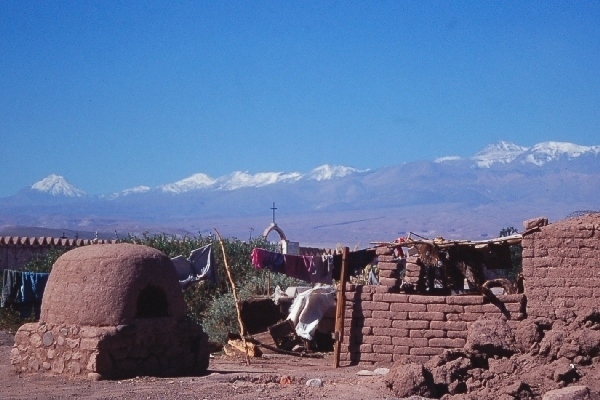 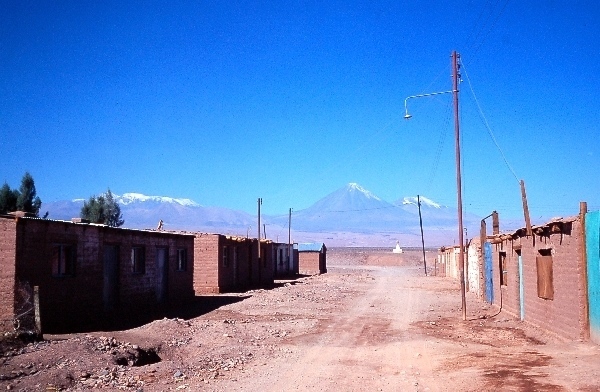 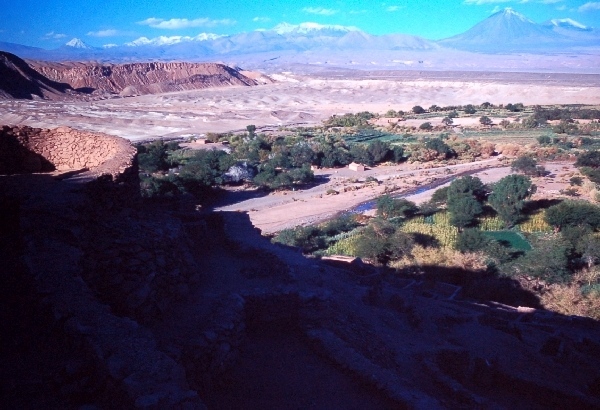 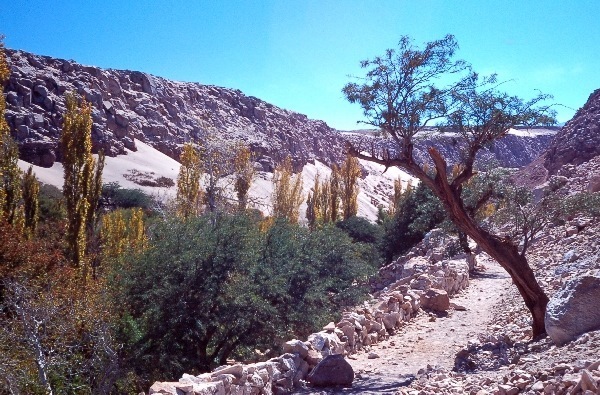 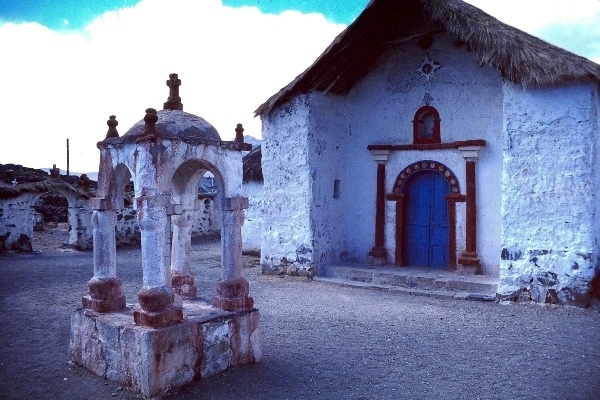 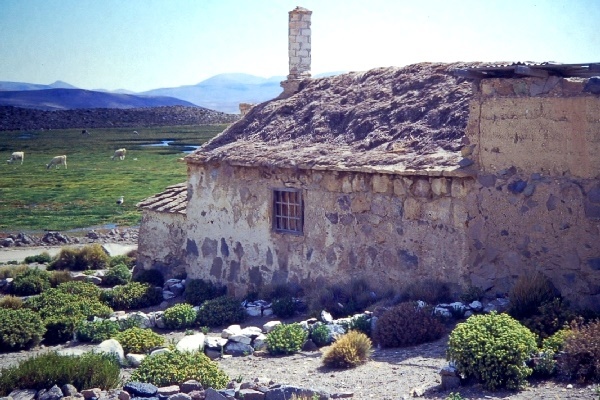 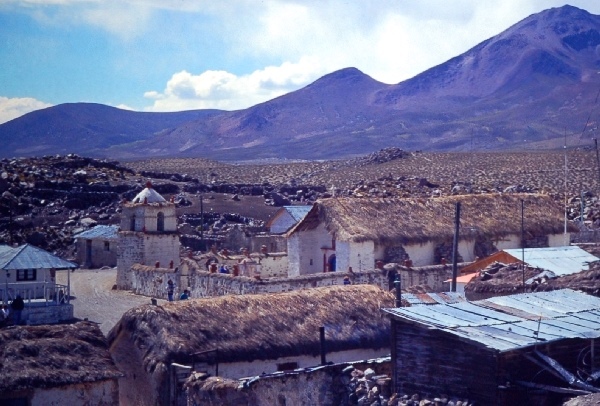 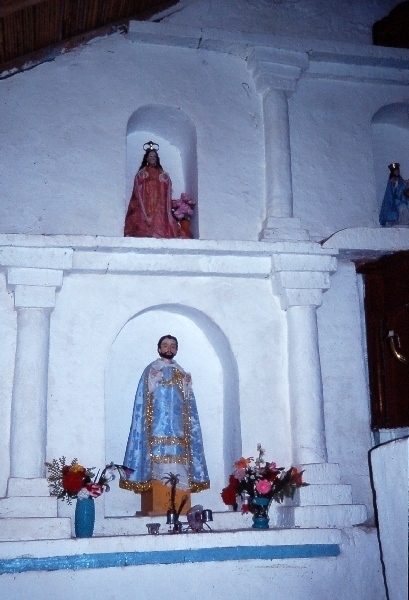 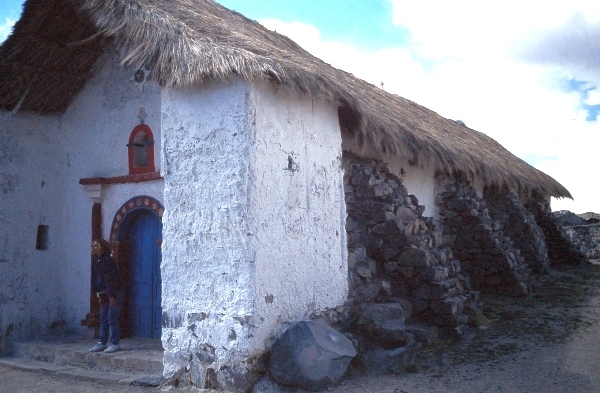 There is a very nice but touristy village called San Pedro de Atacama, which I really enjoyed. 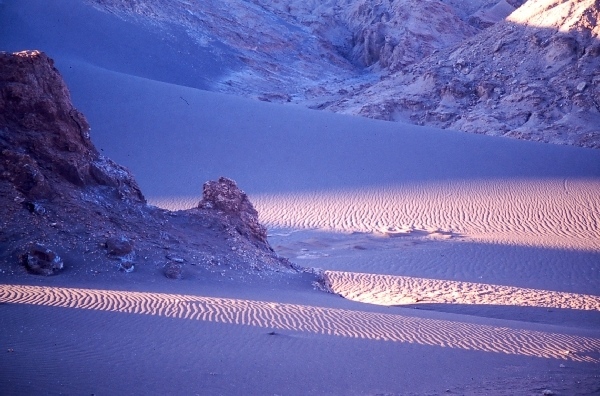 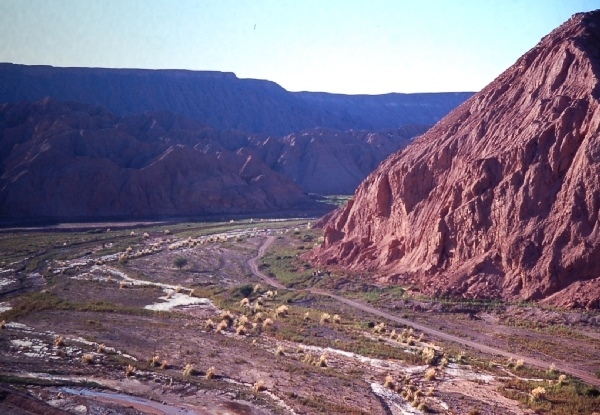 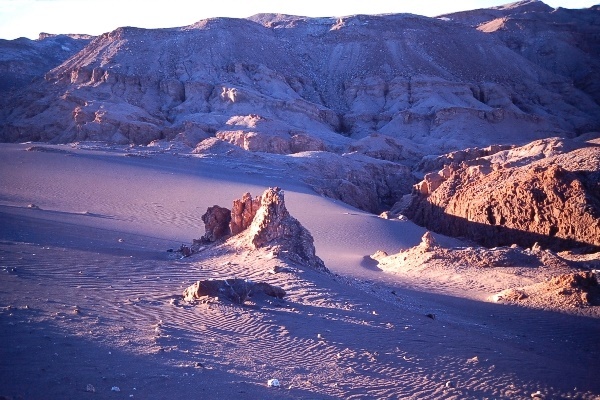 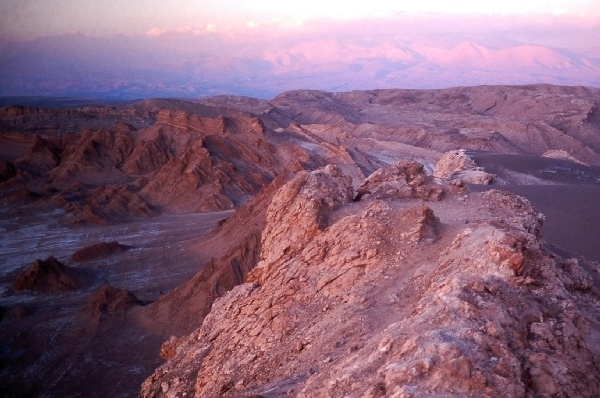 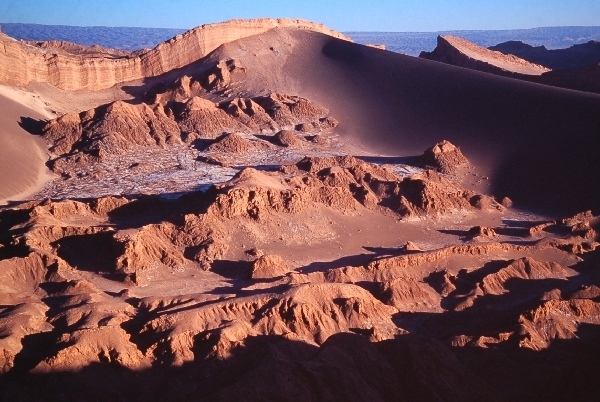 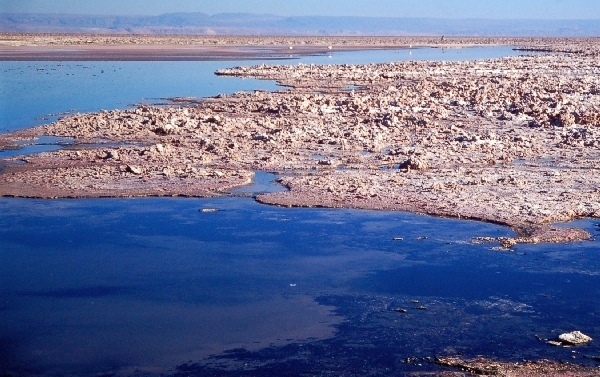 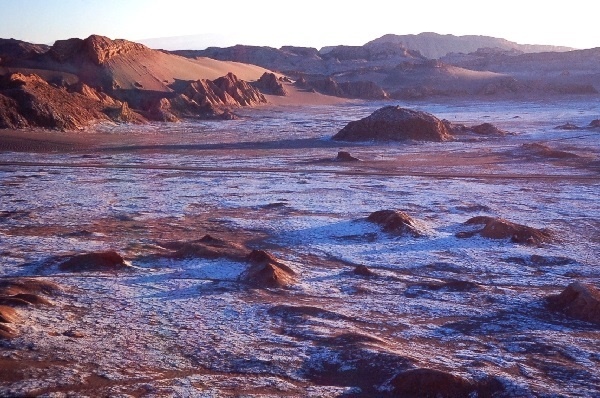 From San Pedro can visit the nearby park called “Valle de la Luna” or Moon Valley. 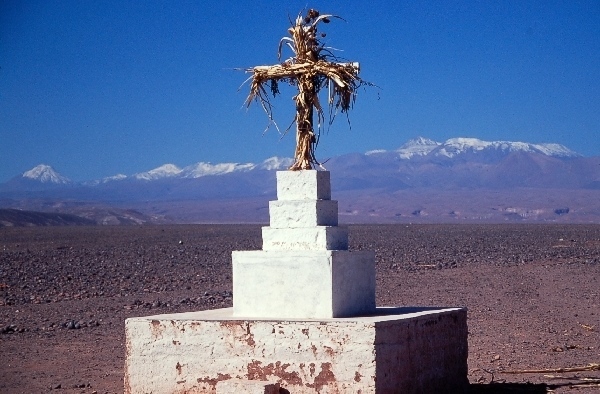 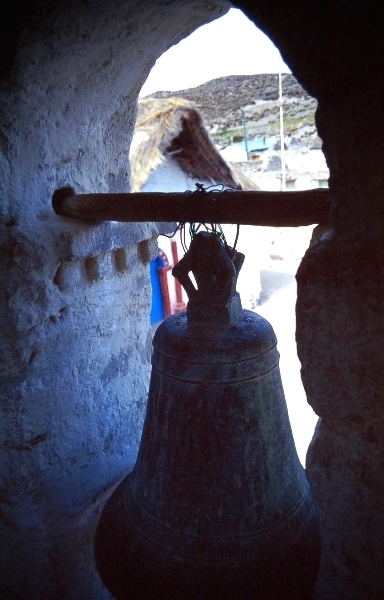 I visited this on my trip through Chile and again a couple of years later having come from Bolivia. 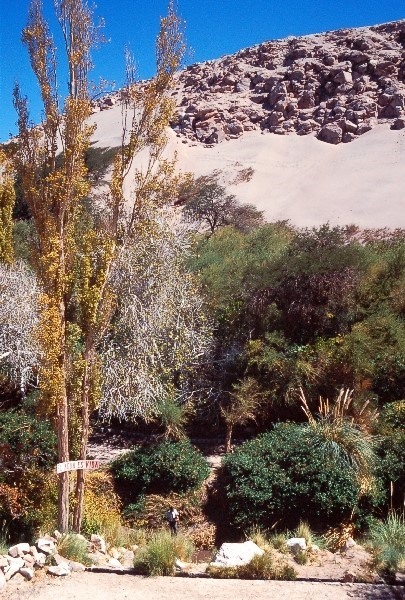 One has to hike a ways into the park, passing a small river with an oasis. 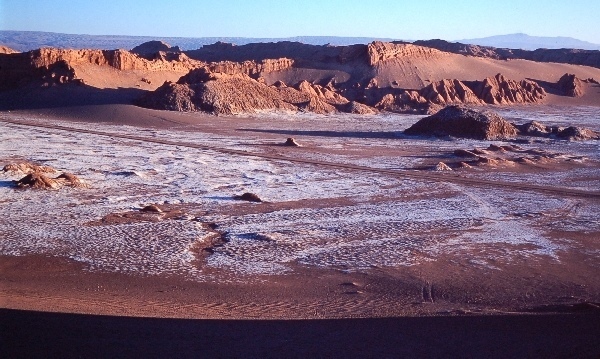 There is a shallow salt sea left where nothing grows. 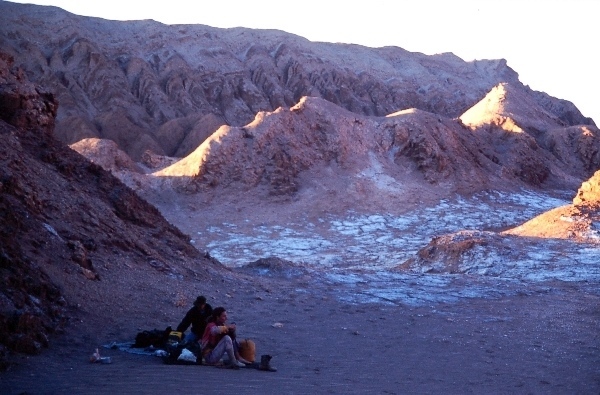 The nights are so clear; it is worth camping out under the stars but take a warm sleeping bag. 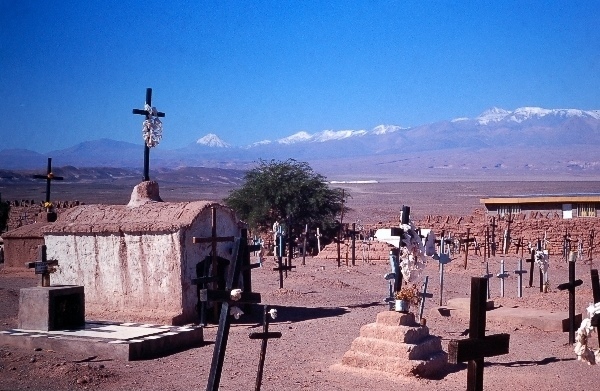 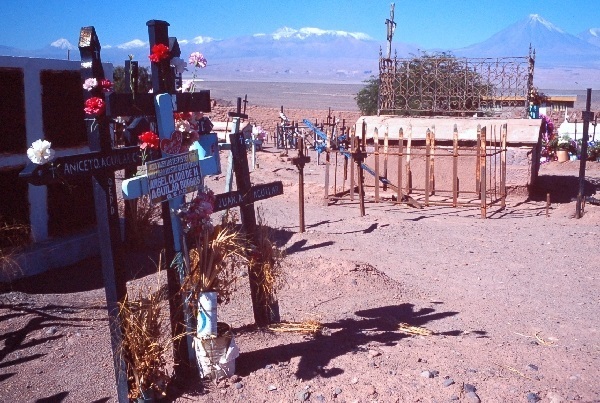 I don’t have photos from in San Pedro but from a similar styled village nearby including a picturesque graveyard with the chain of mountains in the background. 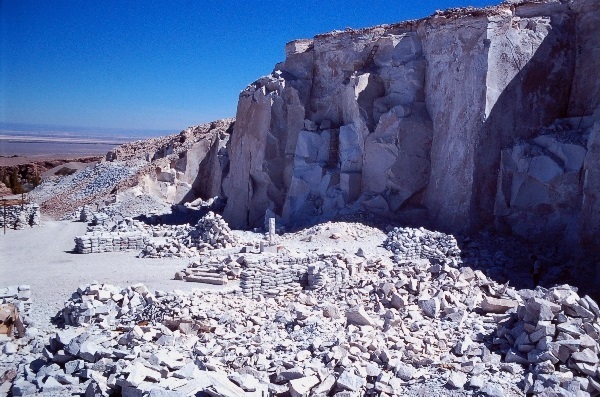 I also visited a quarry that was near the village of Toconao in the San Pedro region. 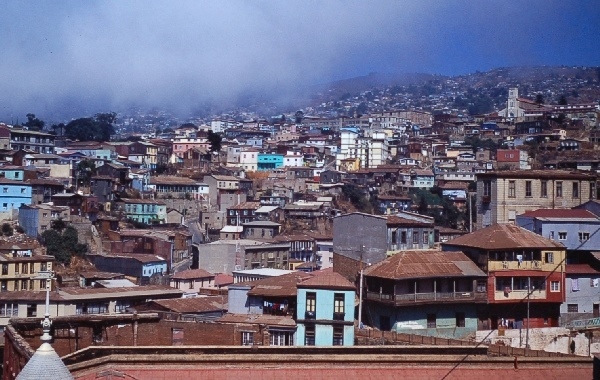 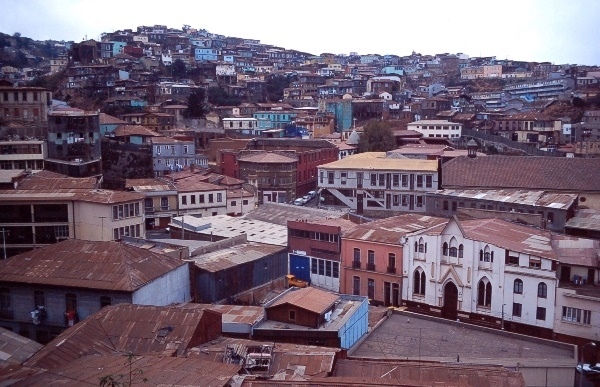 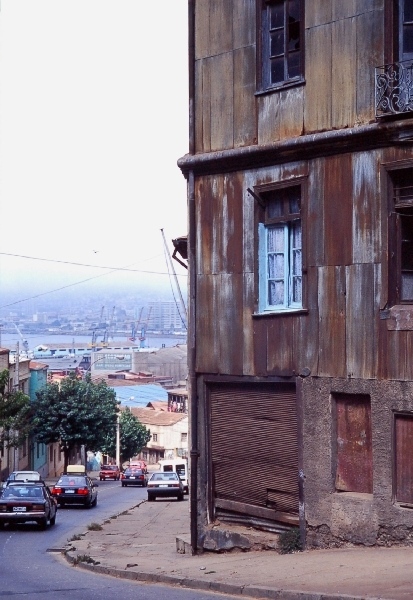 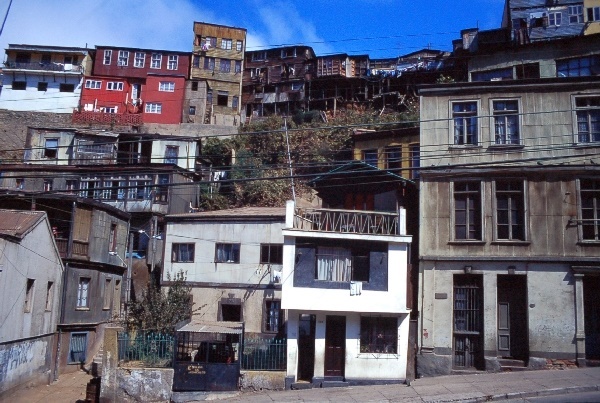 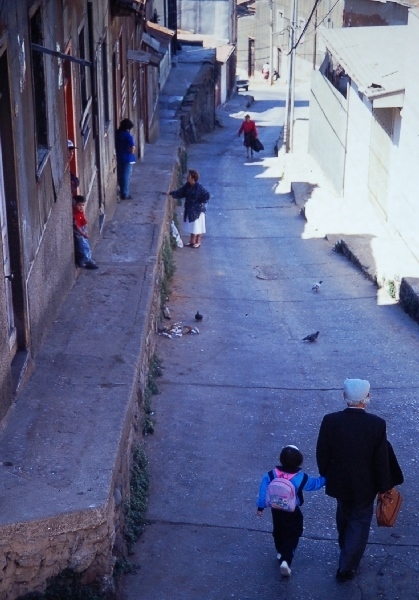 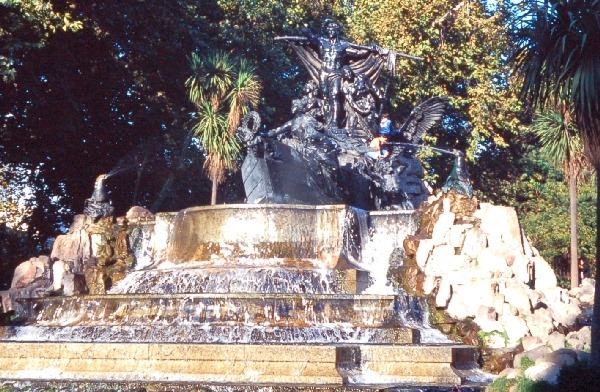 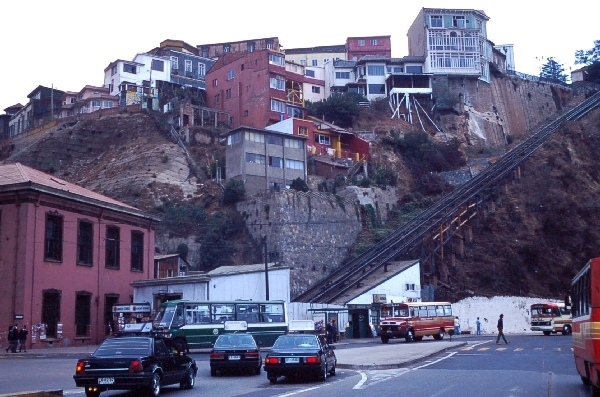 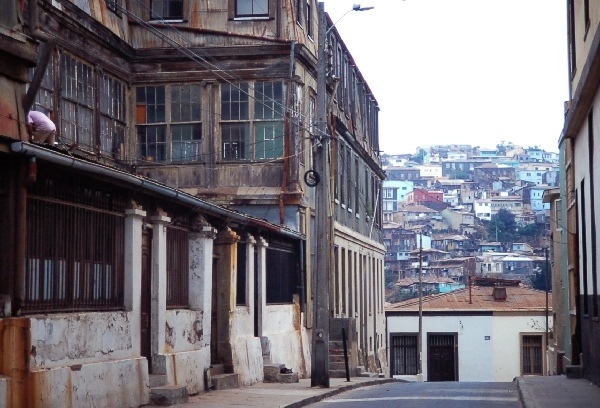 Valparaiso is a fairly important city on the coast some 120 kilometers north of Santiago. 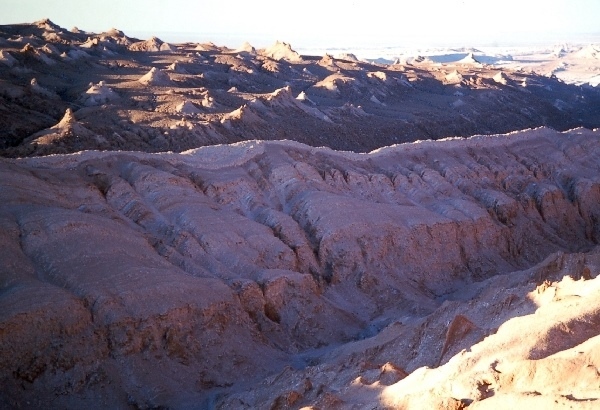 Since most of this part of the Pacific coast is desert, much of the human subsistence comes from the ocean. 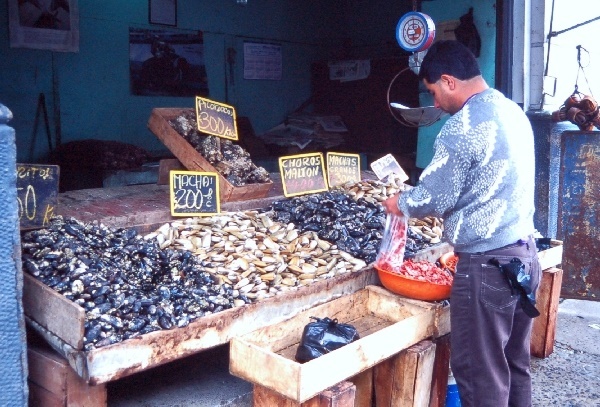 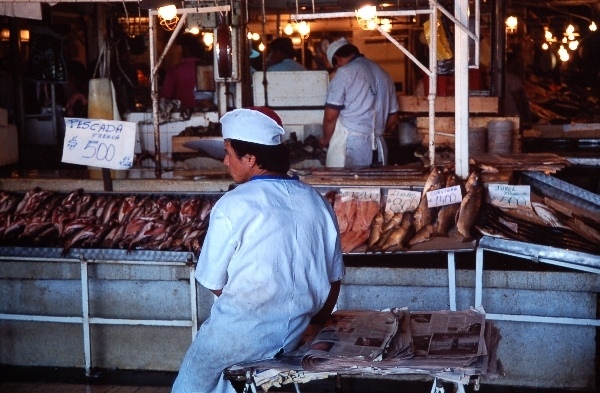 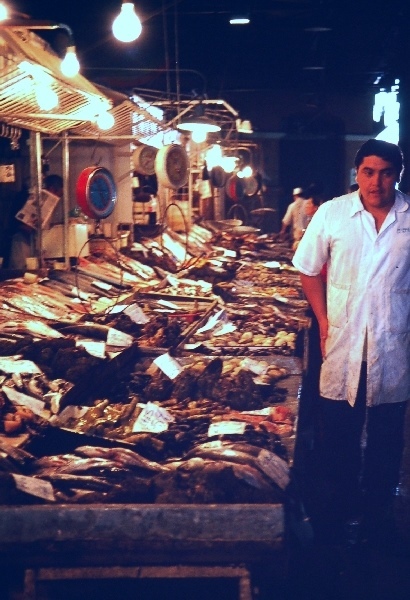 There are a lot of fish canneries in northern Chile and southern Peru and boy do they ever stink! 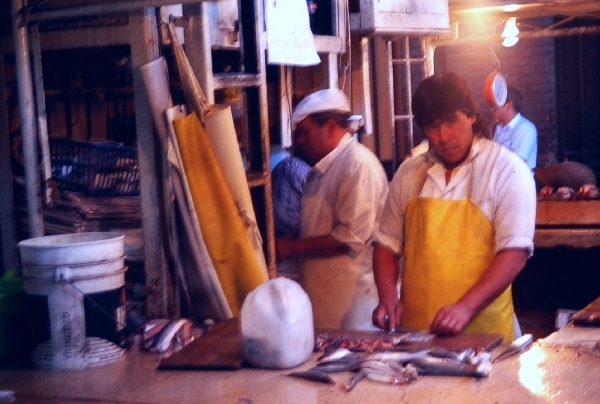 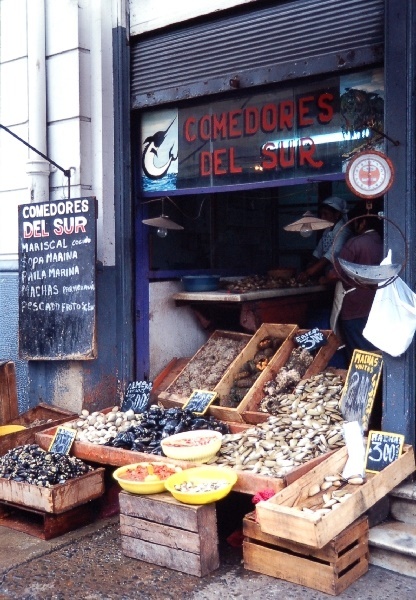 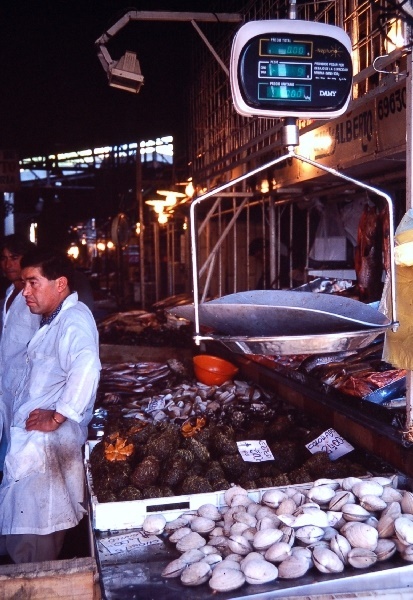 This is not the case in Valparaiso but then to smell some fish one needs only to visit the big and popular fish market in the port area. 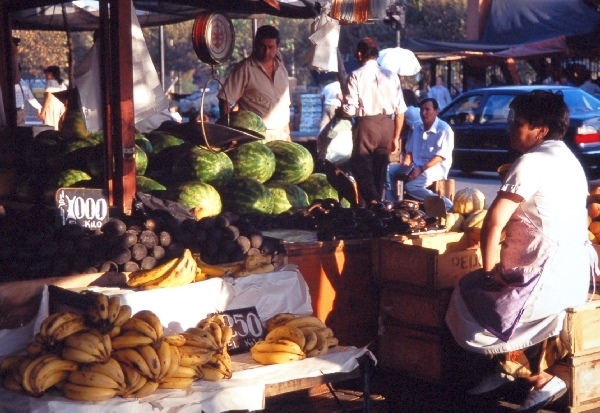 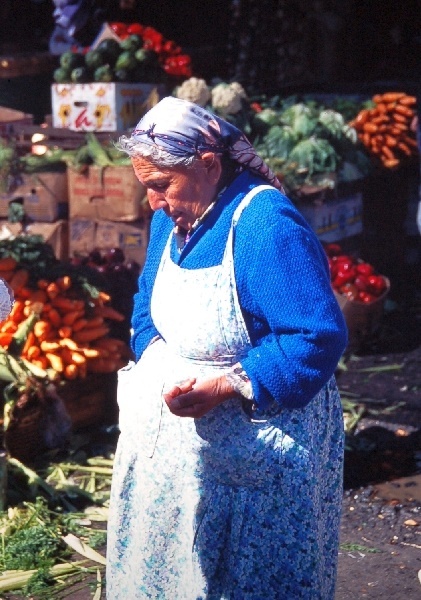 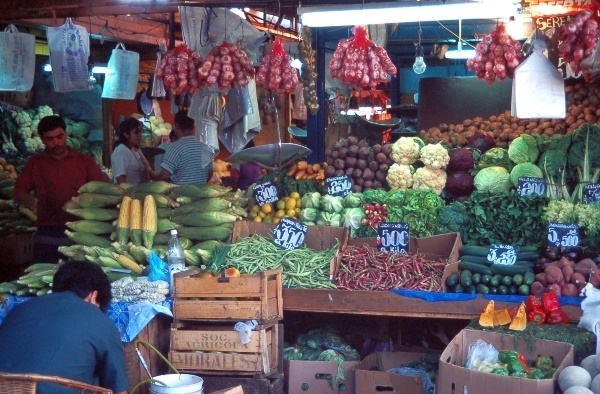 There are lots of little simple eateries within the market where you can sample the local food. 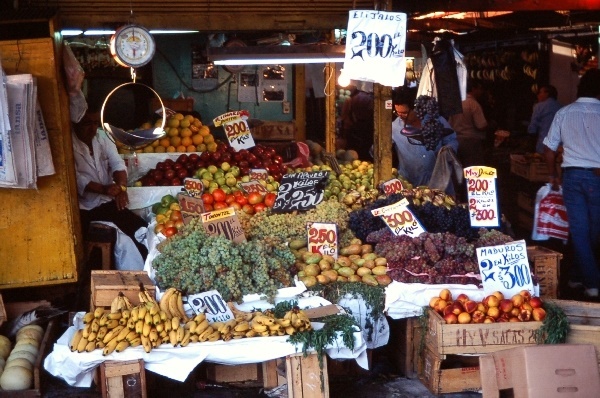 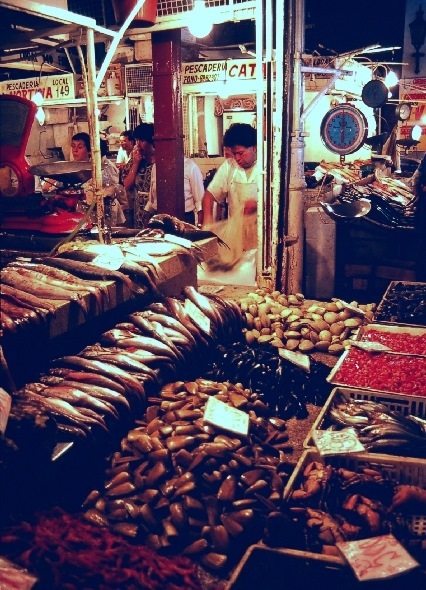 They sell some fruits and veggies there too but the main focus is fish and seafood. 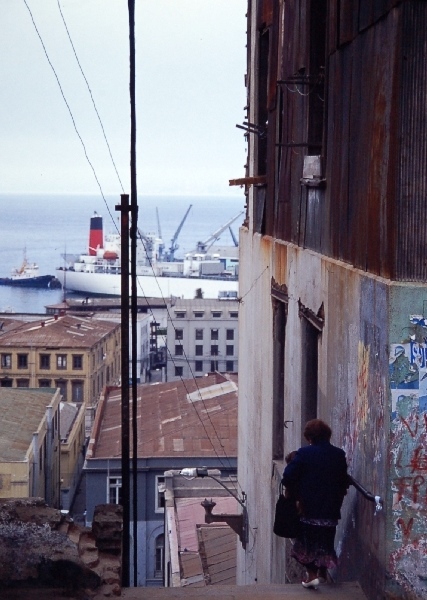 Valparaiso however is built around a major port, which has some of the biggest infrastructure for loading ships I’ve ever seen. 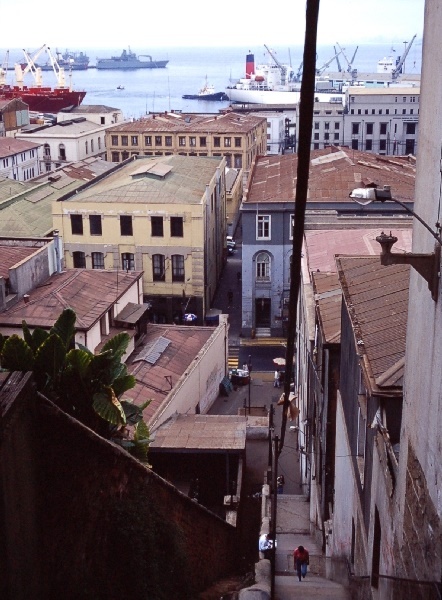 The city continues up some high hills overlooking the port. 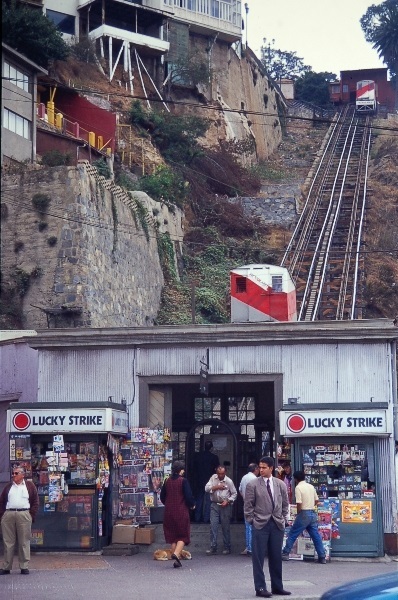 There streets are so steep that they have special trains pulled along by cables to acend the slopes. 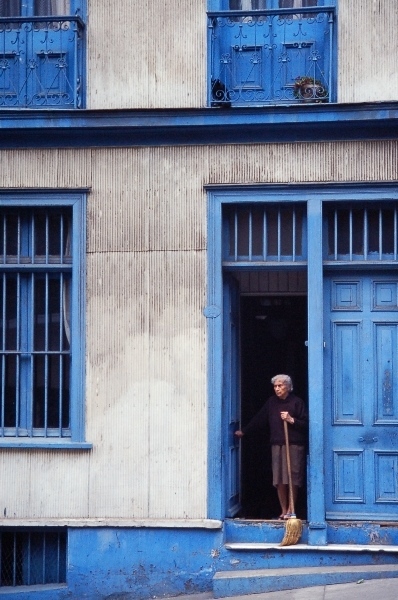 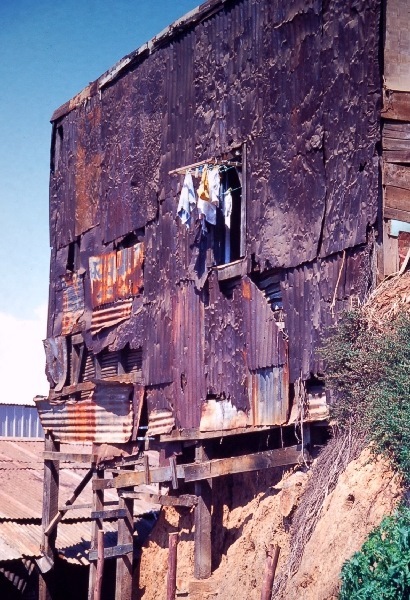 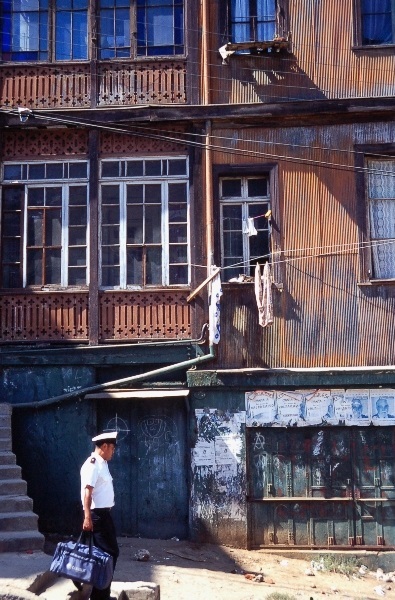 These photos show some of the typical old sheet metal sided houses that characterize the city. 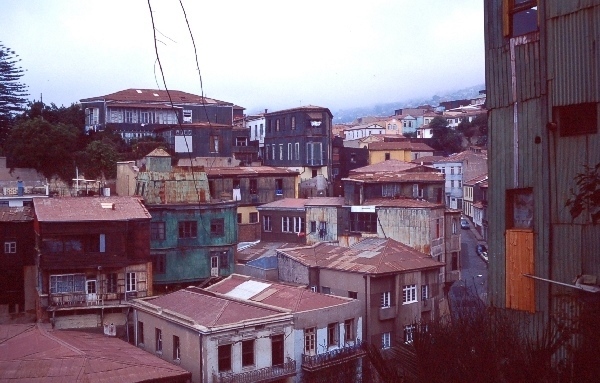 In more recent times there was a major fire that destroyed much of the old town. 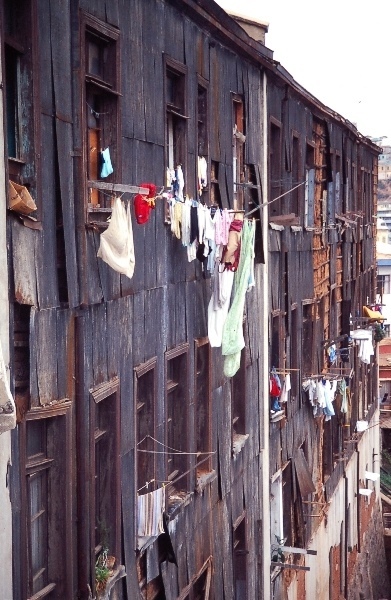 Hard to fight fires at buildings literally built on top of each other. 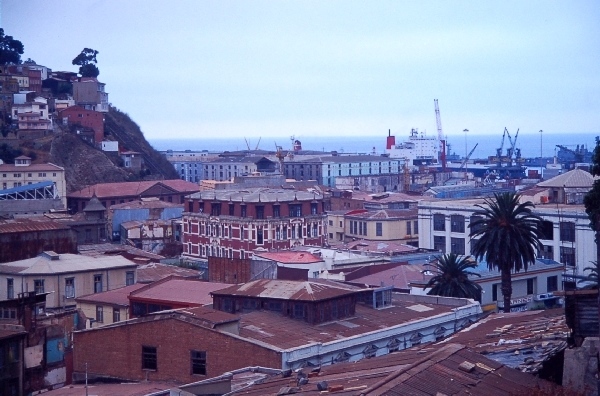 Kind of a paradox thinking that such a location has an accessible port and elevation protecting much of the city from possible tsunamis. 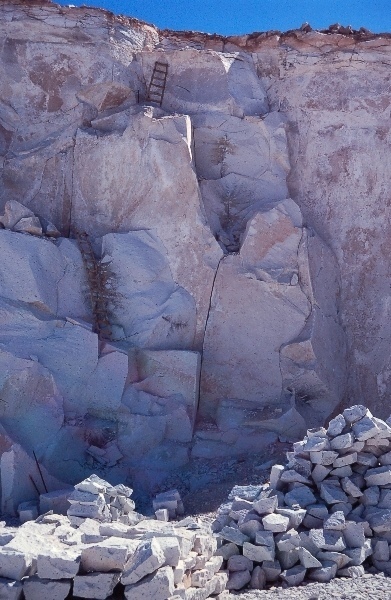 Like pick your risk, fire or flood. 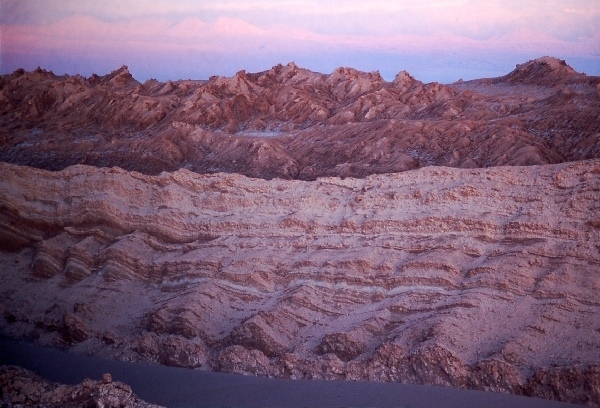 My last destination in Chile was Arica close to the Peruvian border. 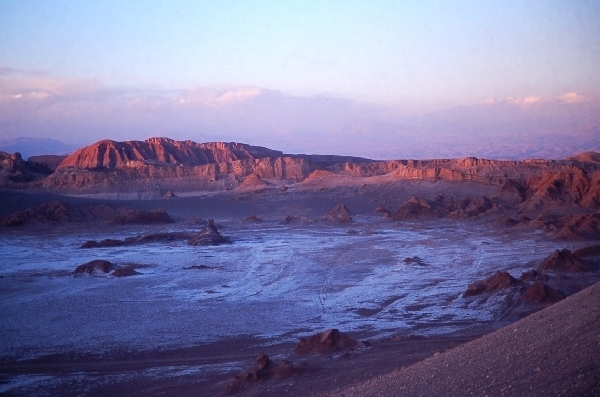 The Atacama Desert there is supposed to be THE driest place on Earth and Arica close behind but it drizzled one afternoon I was there. 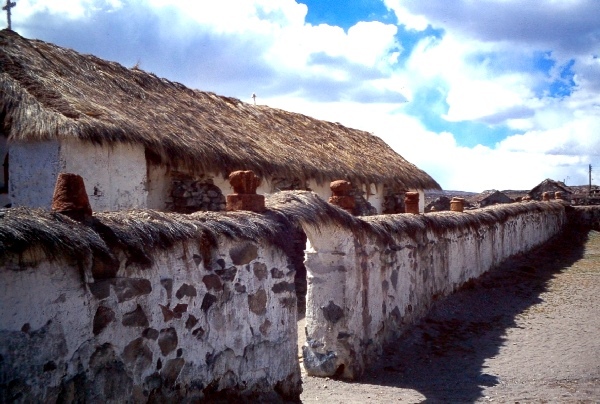 But mostly it was sunny and pleasant and I hung out a couple of days at the beach and did a day trip to Lauca Park, which is up towards the Bolivian border. 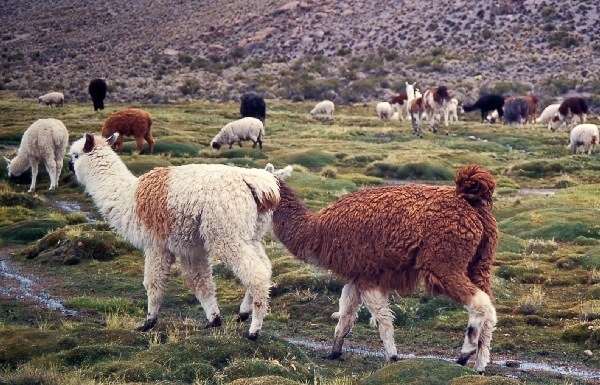 I saw lots of vicuñas, alpaca, lamas, flamingos and viscachas, which are related to chinchillas but look like big rabbits with long floppy ears which lay around looking stoned. 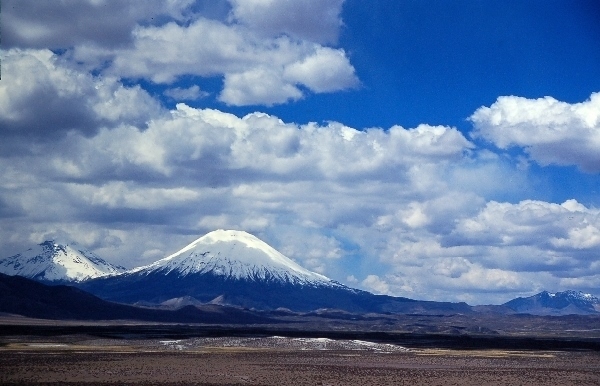 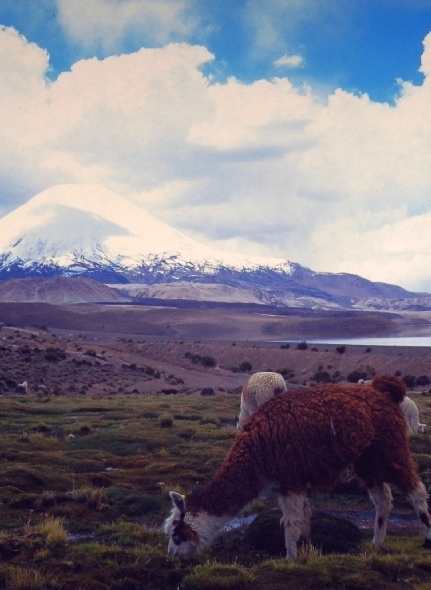 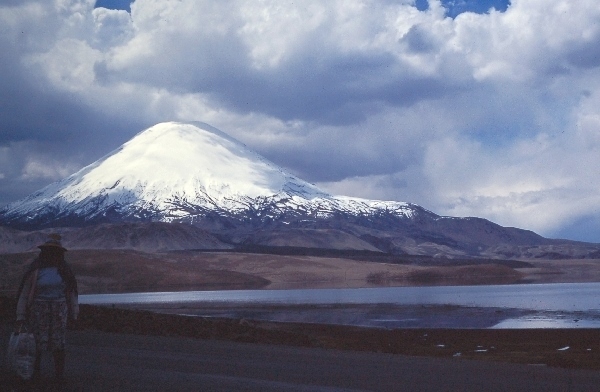 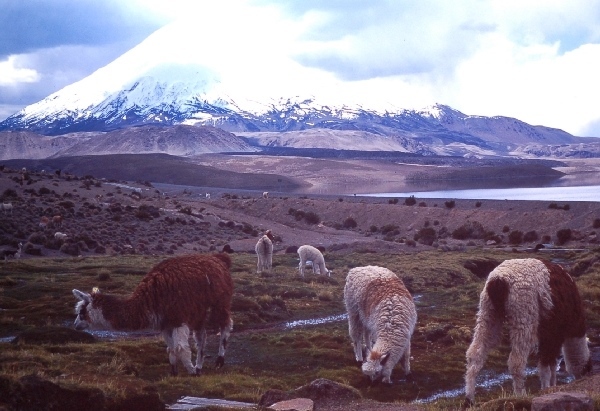 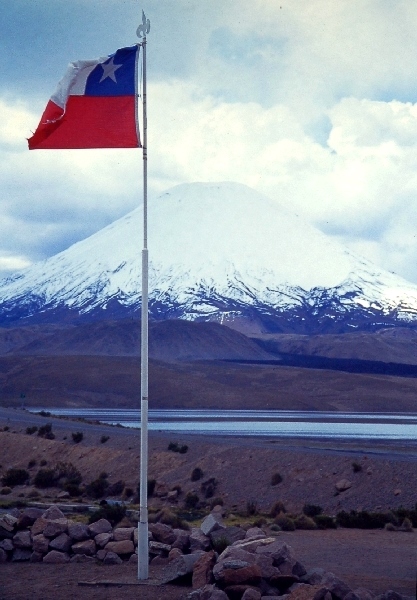 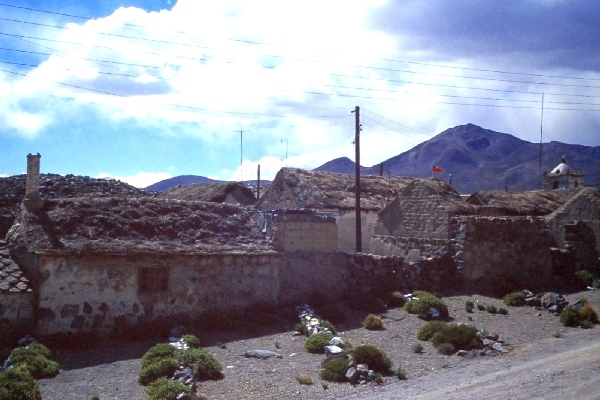 Lauca is high plateau at least 3000 meters and was a hard trip to these altitudes form sea level. 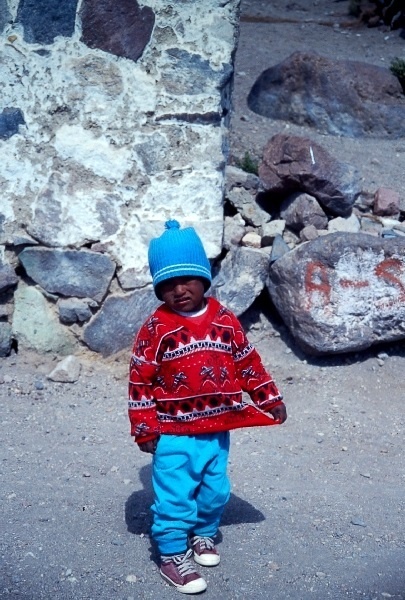 Easier to acclimatize if one comes from Bolivia. 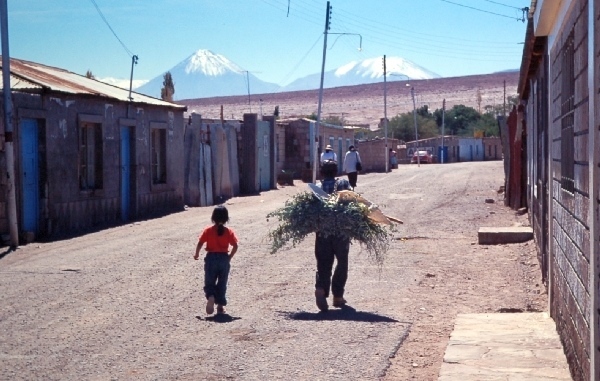 From Arica I had a long bus ride back to Santiago to catch my flight back to Europe. 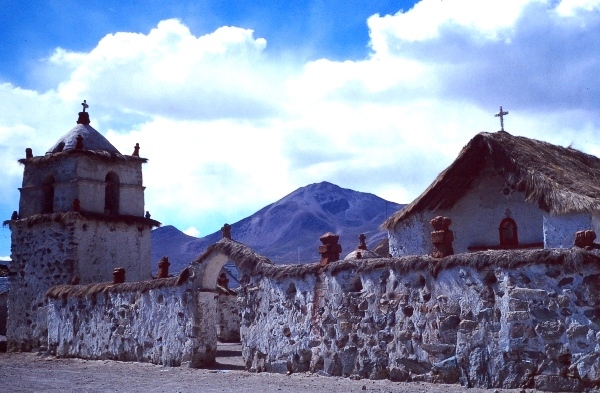 There were also a small village with an old church complex in the area. 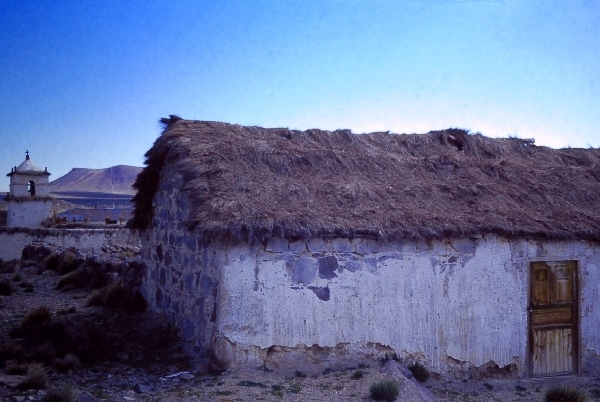 Interesting was the use of staw for the roofing and on top of the perimeter walls as well. 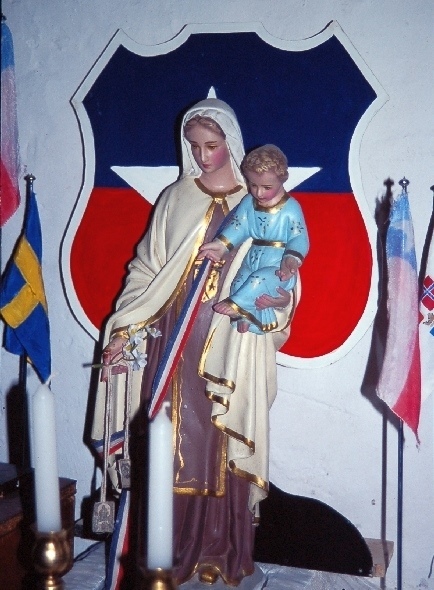 Inside were of course lots of images of Mary and like in many countries where they mix religion and nationalism, Mary with a Chilean sign emblem.